When Carol Chyau discovered yak down during her travels to Yunan, China, she knew that the best way to help catalyze the growth of social enterprise in China was to start one of her own. Chyau founded Shokay, a textile company which crosses disciplines and geographies to bring premium yak down products to market and social change to the communities behind them. Yak fibres are sustainable alternatives to cashmere and wool — they are 30% warmer than wool and 1.6 times more breathable than cashmere. They have a fine, smooth texture as a result of their fibre lengths. As a comparison, an individual yak fibre is 18-20 microns with a length of 30-40mm, and cashmere is between 14-30 microns and 20.5-90mm long. Taking inspiration from the qualities of the yak fibre, Shokay has developed an extensive range of fabrics, yarns and hand-knitting yarns in 100% pure yak down for luxury outerwear, as well as in unique yak blends composing of wool, organic cotton, in-transition cotton, hemp, Tencel™, and recycled PET. Animal fibres often get a bad reputation for having high environmental impacts due to land use, water consumption, animals feed and chemicals required for production (EAC “Fixing Fashion”, 2019). More importantly, animal farming for textiles brings up several issues surrounding their welfare, ethical treatment and effects on biodiversity. 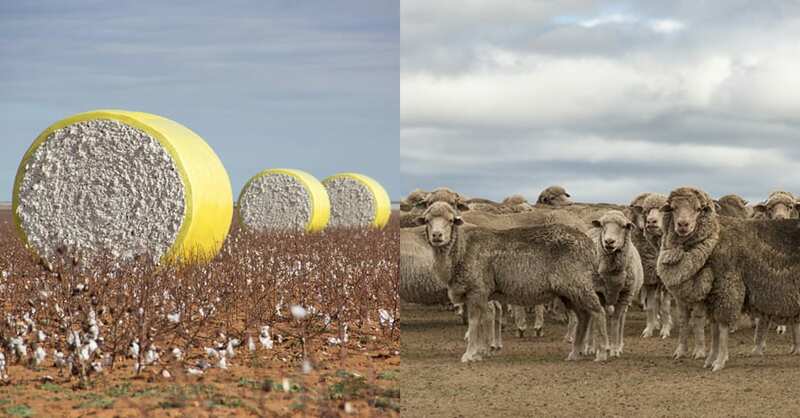 However, when farmed responsibly, animal fibres can be a sustainable choice as they have high-performance technical properties and very low end-of-life impacts on the planet (compared to other natural fibres such as conventional cotton, or synthetic fibres such as virgin polyester). 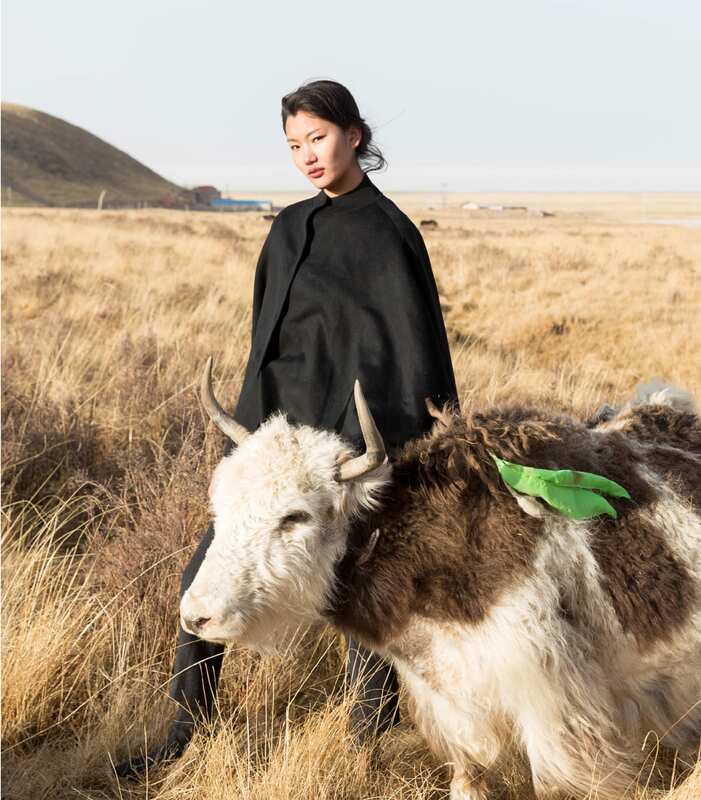 And as Shokay’s social enterprise model proves, the sustainable production of an animal fibre such as yak down can also leave a positive social impact. 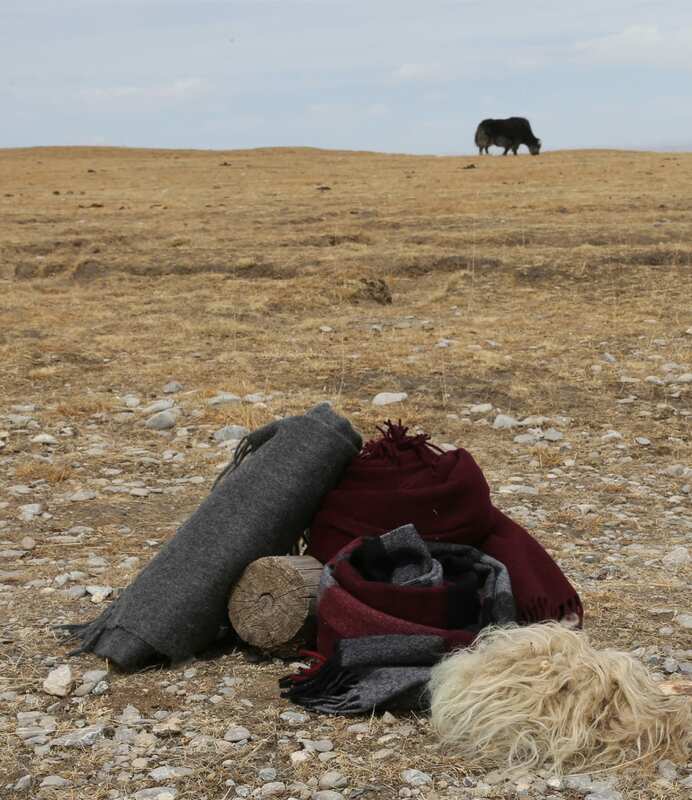 The yak fibres used in Shokay’s products are sourced directly from Tibetan herders, enabling them to earn a living while preserving their traditional herding and community lifestyle. 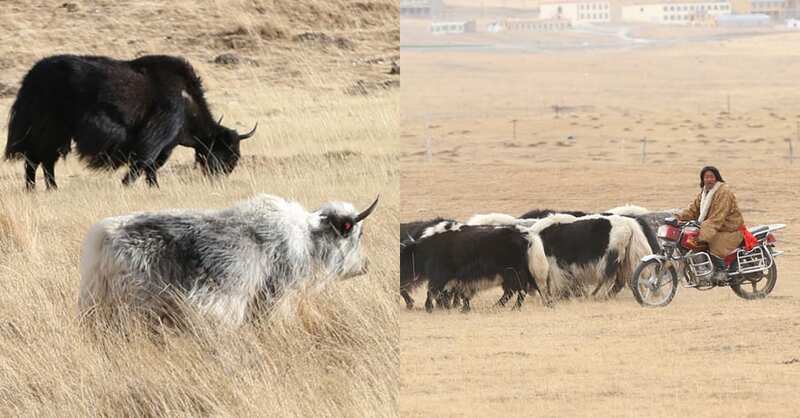 The process of raising yak in these particular communities is responsible: yaks are low-carbon emission animals that have a semi-nomadic lifestyle which prevents overgrazing of land; their tongues are short, therefore they do not pull grass from the root when feeding which is beneficial for grassland conservation; during harvesting, the hand-combed method used is not harmful or invasive for the animals; the relationship between yak and herder is personal and animals are treated as an extension of family and livelihood. One per cent of Shokay’s sales revenue goes towards their Community Development Fund, empowering the communities in their supply chain. Over 800 herders in Western China have benefitted from Shokay’s healthcare programs. A projected 500 tonnes of yak will be sourced in the next 3 years, with the opportunity to positively impact one million Tibetans. In addition, Shokay invests in animal husbandry and land conservation workshops that develop the knowledge and skills of the community and of future generations. Carol Chyau’s social enterprise has drawn attention for its vision — in 2006 her business idea won first place at the Harvard Business Plan Competition. She was selected as an Echoing Green Fellow in 2008, a finalist for Cartier’s Women Initiative, one of Forbes’ Top 30 Entrepreneurs under 30 and named Top 5 Social Entrepreneurs at the Chivas Venture Competition. Shokay says that yak can really play a part in the future landscape of materials. 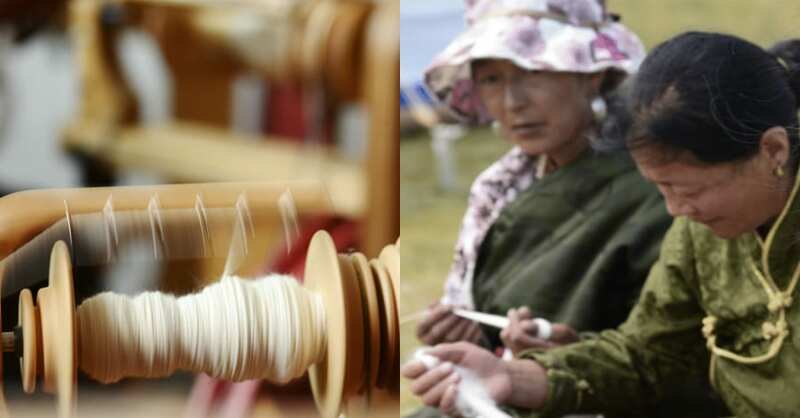 Since yak is not yet commercialised, the company has spent several years developing a traceable supply chain for their yarns and fabrics, even creating the first yak grading system. 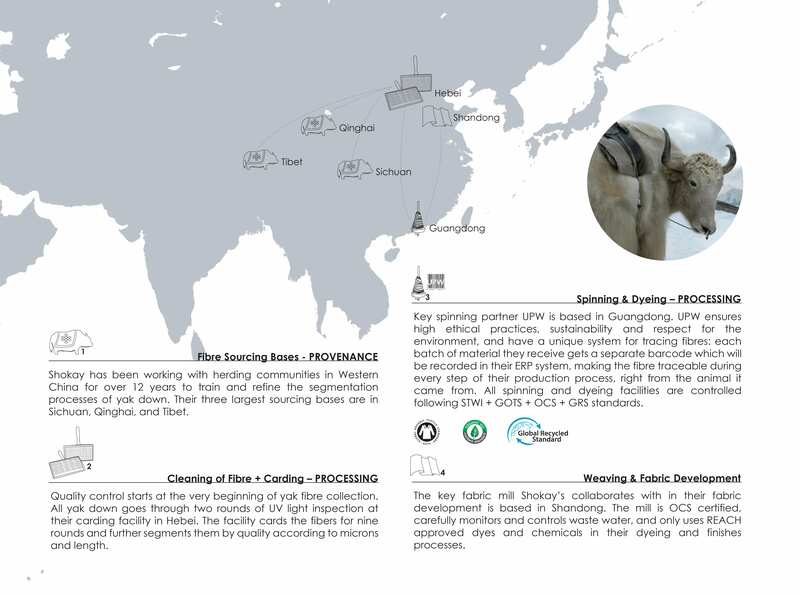 By working closely with their partners, Shokay has the ability to set the standards for yak collection, segmentation and processing to ensure sustainable scaling and prevent negative practices that might disrupt the yak fibre supply chain. The company believes that the fashion industry needs to address our pressing environmental and social challenges by integrating change at every level of the supply chain: from sourcing sustainable raw materials, to working with certified mills, to auditing humane garment factories, to marketing campaigns that educate end consumers regarding the urgency and importance of knowing where your products come. As for what’s next, Shokay has been busy collaborating and adopting holistic approaches to the way they develop products. 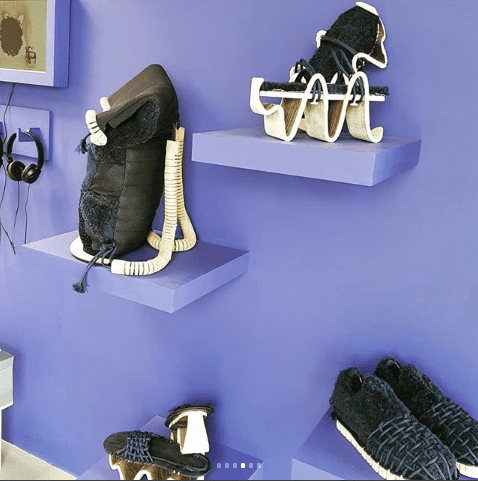 Last year they launched Shokay Lab, a community of brands, designers, and manufacturers that share resources and jointly develop products that are thoughtfully made. The creative social enterprise also has plans to launch an accelerator program to empower material innovation. Seems like a strong contender for the future of fabrics. Shokay will be presenting a joint masterclass with The Sustainable Angle on 9 May 2019, from 9:30-12: 30 pm in our London Showroom, W10. Registration details TBC. During the festive season we are bombarded with even more pressure to buy, update our party looks and overload our wardrobes, encouraging rapidly increasing clothing waste. 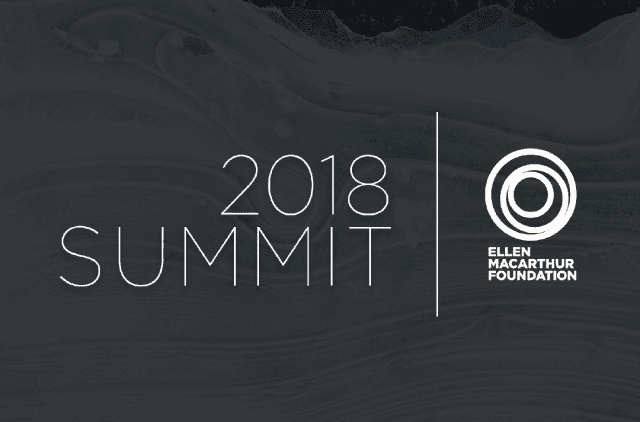 According to the report A New Textiles Economy: Redesigning Fashion’s Future published by the Ellen Macarthur Foundation in 2017, 53 million tonnes of fibres are produced annually for the clothing industry, and 73% of garments end up either landfilled or incinerated after consumer use. • If you buy, choose only items that can create new looks by complementing what is already in your wardrobe. Before purchasing, think about how many times you will likely wear the new item. The #30wears rule suggests that when shopping, ask yourself if you would wear an item at least 30 times – but aim higher, we would say at least #300! • Prolong the life of your clothes by following the washing instructions inside. The Carbon Trust reports that 1.5% of global production of CO2 emissions occur in the consumer washing/laundering process. Check garment labels to care for your clothes properly, skip the dryer and opt for line drying, use cold water settings and wash less often so we can protect our world’s drinking water. • Invest in filtration gadgets such as this gadget to help fight the microfibres problem that comes from washing our clothes. 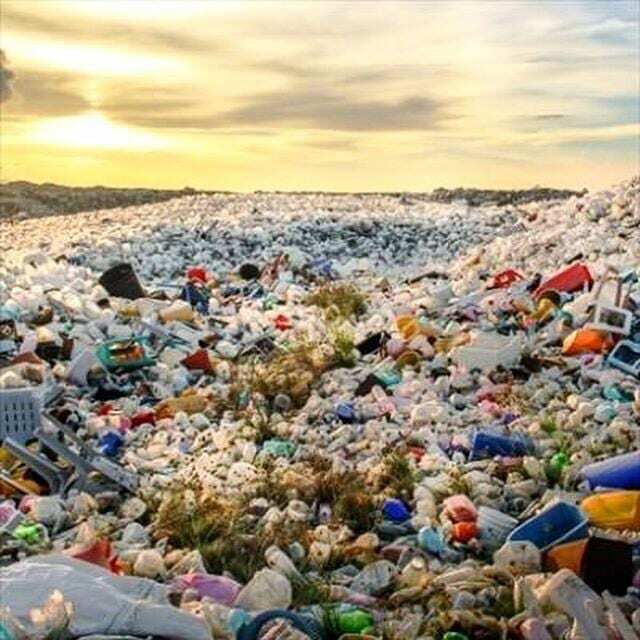 Synthetic fabrics shed tiny plastic microfibres when washed – 250,000 plastic microfibres can be released after just one washing of a synthetic fleece jacket (EMPOWER @filterfibers) and up to 700,000 microfibres can shed from a typical 6kg (13lb) household load (BBC News). It is not perfect but improves the situation. • Clothes swapping and rental systems: Hold clothes swaps with your friends, or join designer rental companies such as Rent the Runway, DrexCode, or Armarium. London-based Higher Studio offers more avant-garde choices for the artistically inclined. 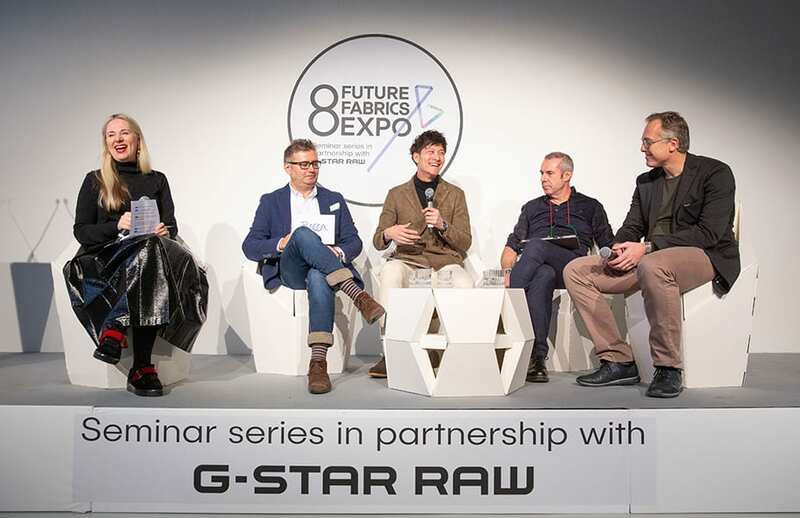 Discover sustainable materials, fibres and the innovations that will influence the future of a more sustainable fashion system at our upcoming 8th Future Fabrics Expo on 24-25 Jan, 2018. 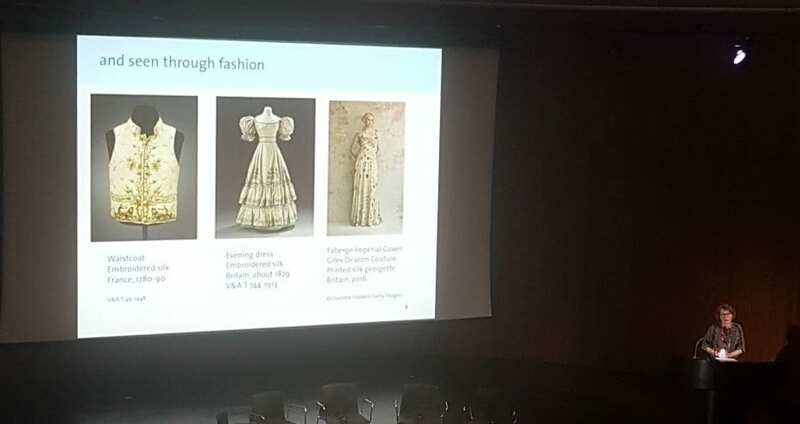 Amanda Johnston, Curator and Consultant at The Sustainable Angle, with our Future Fabrics Expo exhibition at Chatham House’s Reinventing Fashion. Image courtesy of Chatham House. 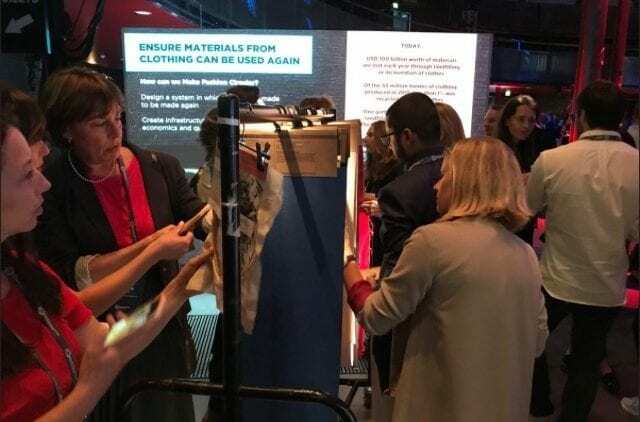 This was the central topic of discussion on the 4 October, when The Sustainable Angle’s Future Fabrics Expo joined “Reinventing Fashion”, an event hosted by the Hoffman Centre for Sustainable Resource Economy hosted at the Chatham House, in collaboration with the Circular Economy Club. 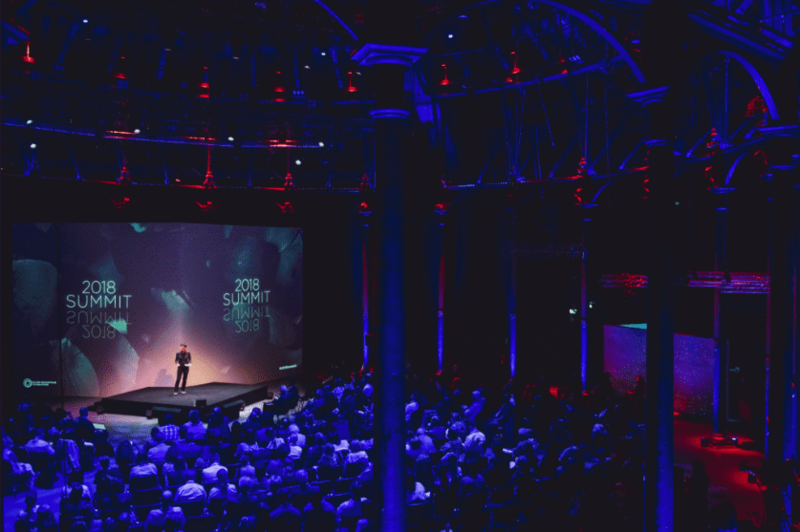 The event brought together consumers, designers, retailers, innovators, material scientists, business and media leaders, policy makers and campaigners to discuss cutting edge technologies that could shape the future of fashion. 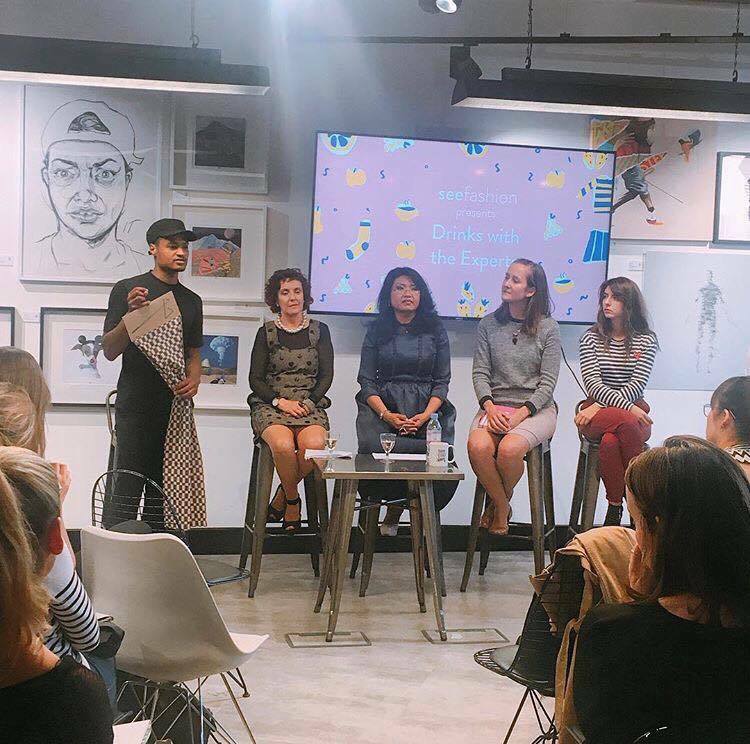 Panel speakers at the event included Sarah Ditty from Fashion Revolution, Pamela Mar from The Fung Group, Fee Gilfeather from Oxfam, Zoe Partridge from Wear the Walk, Giorgina Waltier from H&M Sustainability, and Orr Yarkoni of Colorifix. 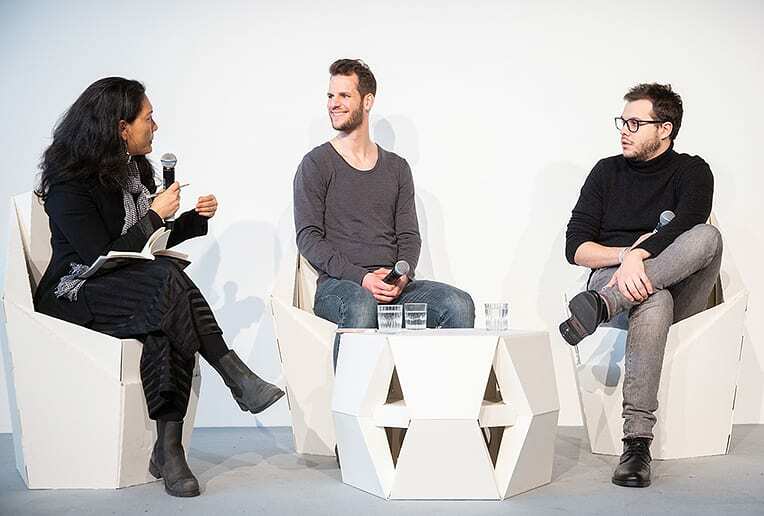 Panel speakers at “Reinventing Fashion”. Image courtesy of Chatham House. 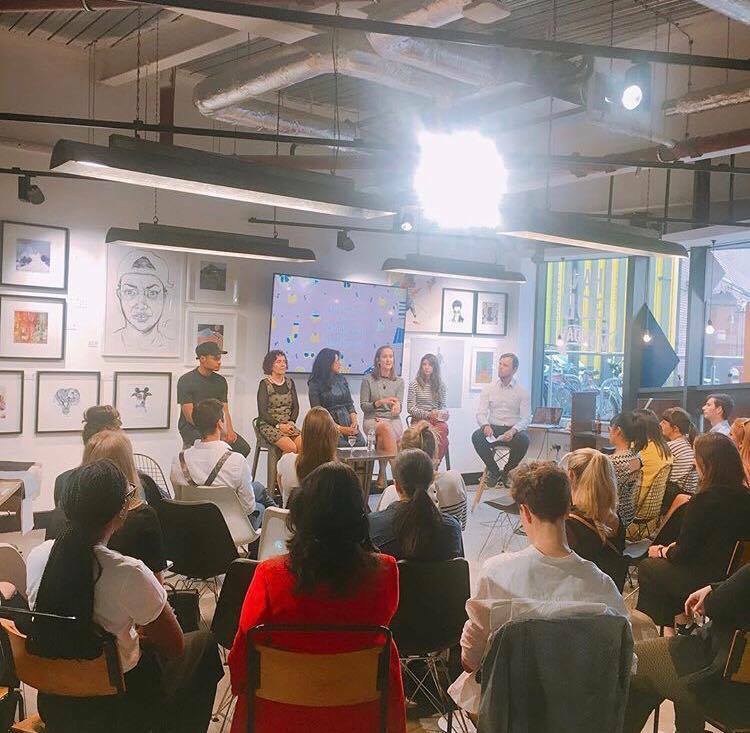 “As a society we purchase 400% more clothing than we did just twenty years ago,” says Sarah Ditty, Head of Policy at Fashion Revolution, during the discussion. With its heavy environmental impact, the current state of consumer fashion paints a notoriously bleak picture: tonnes of unused clothing ends up in landfill waste or incineration, plastic microfibers make their way to the aquatic food chain, and 98 million tonnes of non-renewable resources such as oil, fertilizers and chemicals are consumed for production purposes (Ellen MacArthur Foundation, A new textiles economy: Redesigning fashion’s future, 2017, http://www.ellenmacarthurfoundation.org/publications). “Bring design into manufacturing. So that the designer is aware how any changes can directly affect production. 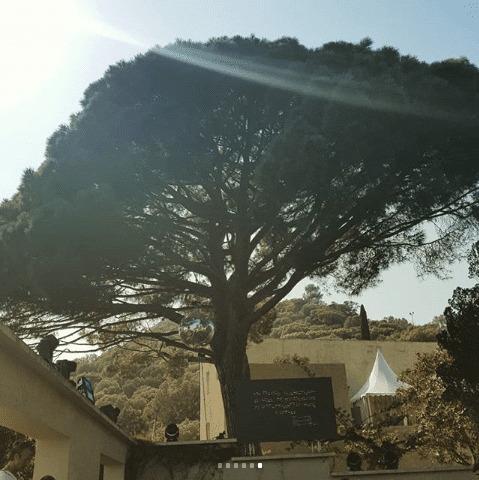 This can be enabled by #tech to create direct connection,” says Mar. Mar could not have described better the work that we do here at The Sustainable Angle’s Future Fabrics Expo. After the panel discussion, guests were invited to preview our curated selection of materials in the halls of Chatham House. 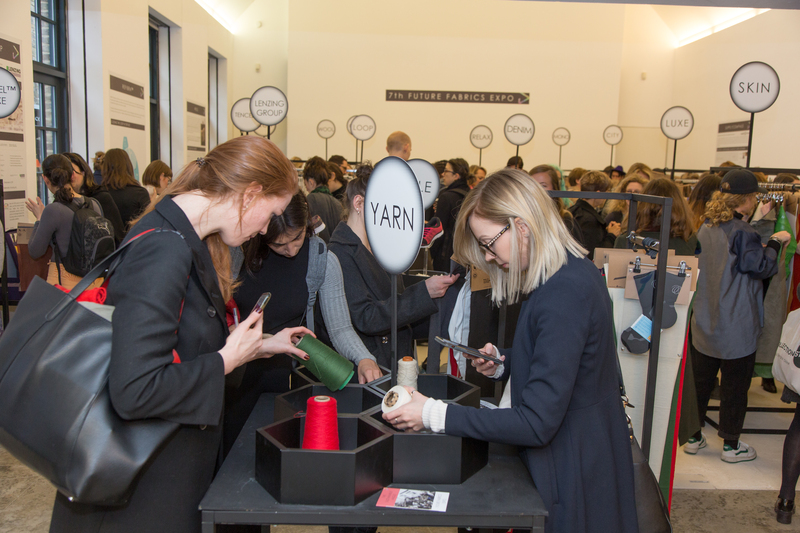 We enabled attendees to have a tactile experience and discover the collective and material efforts of innovative leaders and suppliers who are driving the fashion industry forward. 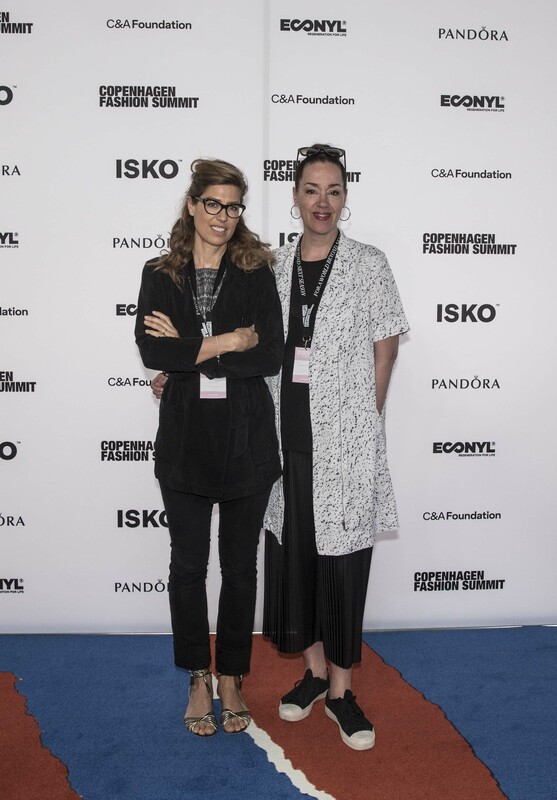 “Reinventing Fashion” was a perfect setting for us, as we continue to provide designers and brands with innovative, integrated solutions to responsible sourcing that challenges the fashion industry. 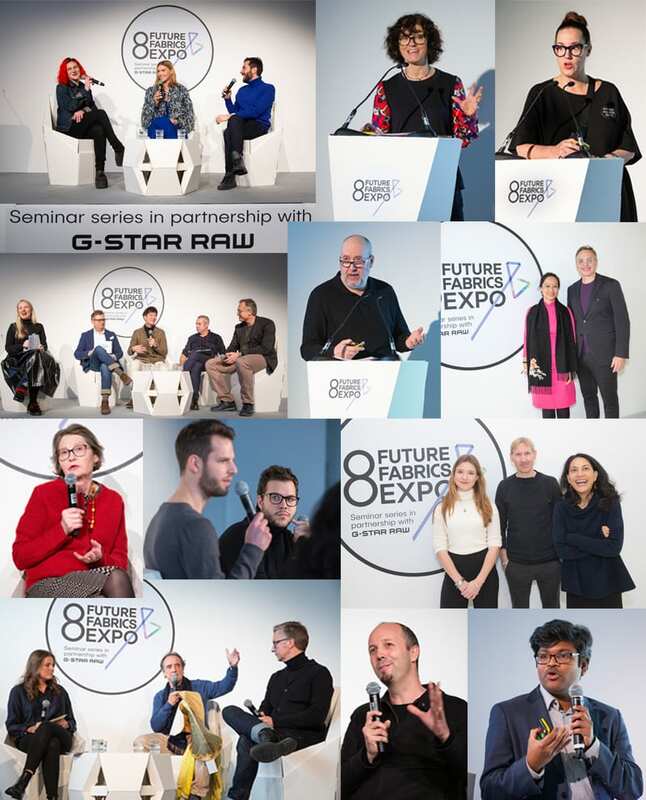 Guests received an exclusive preview of our upcoming 8th Future Fabrics Expo. Image courtesy of Chatham House. Watch the Panel Discussion here. 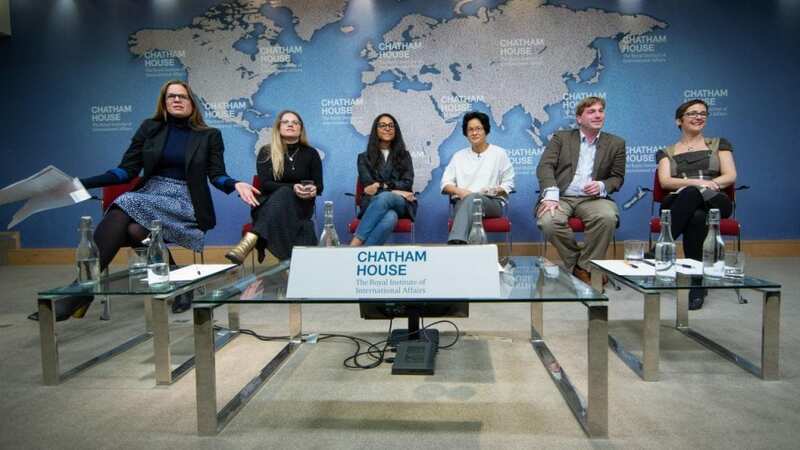 Images and video courtesy of Chatham House. 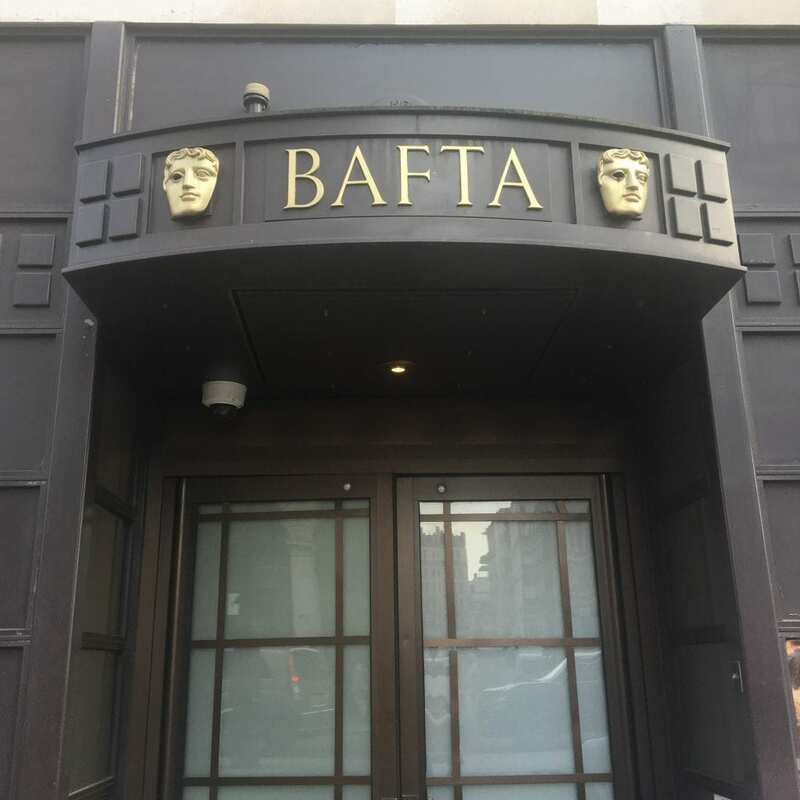 The Sustainable Angle has reached the British Academy of Film and Television Arts. 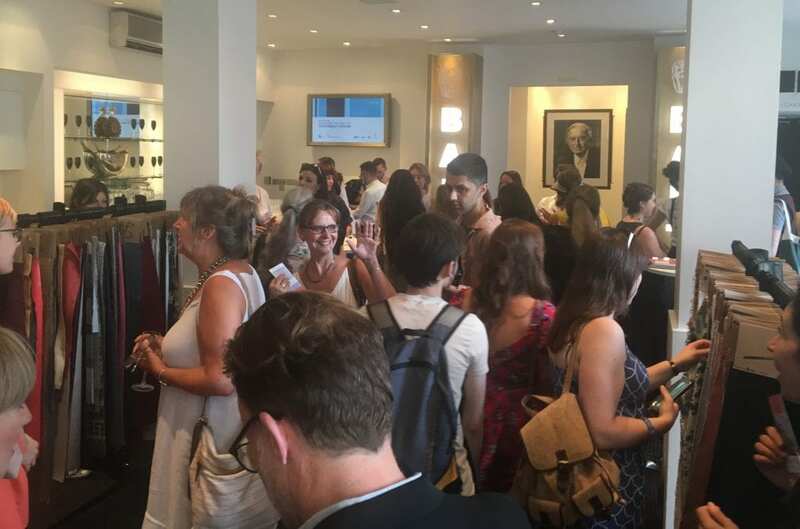 On 6th of July, The Sustainable Angle showcased a selection of low impact textiles at BAFTA as part of the event Albert Quarterlies: Designing the way to Sustainable Costume. The aim was to raise awareness about the importance of sustainability in the costume industry while giving participants the opportunity to make more sustainable material choices by sourcing from a curated showcased by The Sustainable Angle. 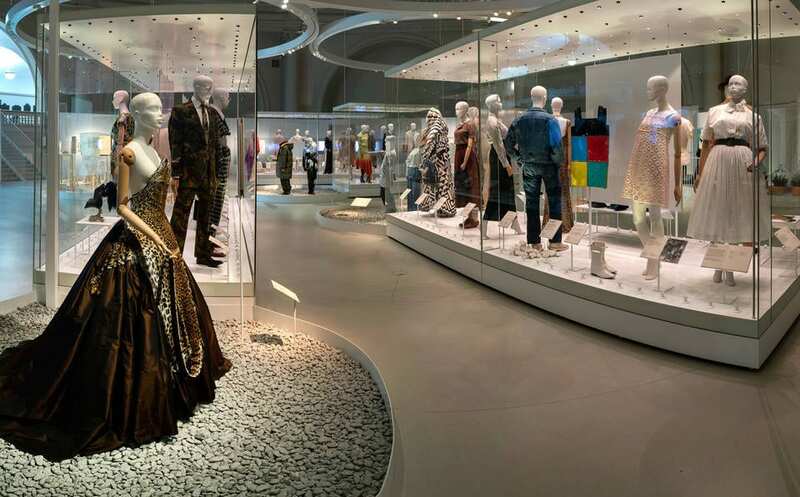 Hundreds of materials were displayed and were selected specifically for costume designers with an attention to small order minimum quantities and short lead times. 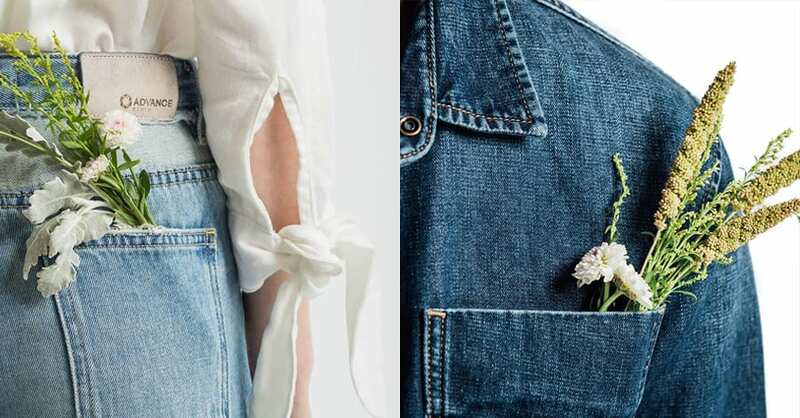 As part of the selection were organic cotton, naturally dyed fabrics, but also bast fibres, colour grown cotton or materials made from food waste and recycled fibres. 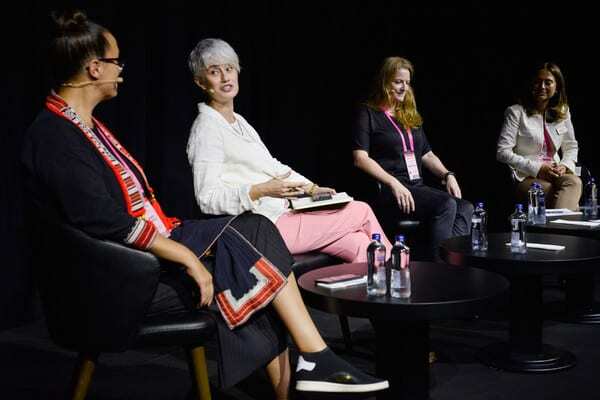 Costume designers have usually only a short time frame to work which is a particular challenge, as well as the frequently changing projects were identified as making sustainability harder to tackle consistently by Sinead O’Sullivan (Co-Founder of The Costume Directory). She highlighted that collaboration and the sharing of resources are key to address these issues. 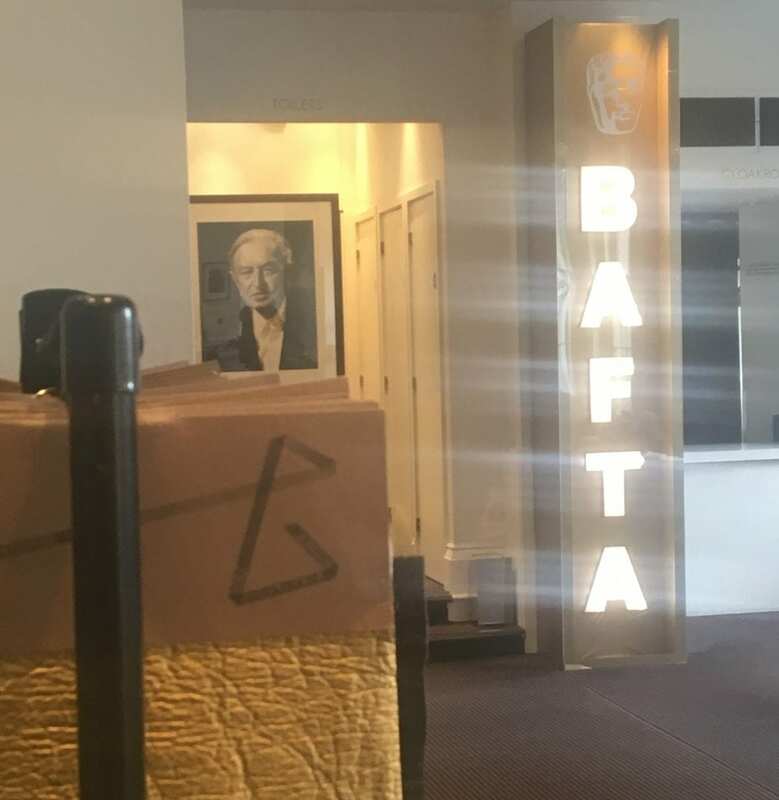 BAFTA and Oscar-winning costume designer Jacqueline Durran discussed how she incorporated sustainability on the set of Beauty and the Beast and Mary Magdalena, from the vintage textiles sourced specifically for the project to the natural dyeing techniques used to create the final effect. 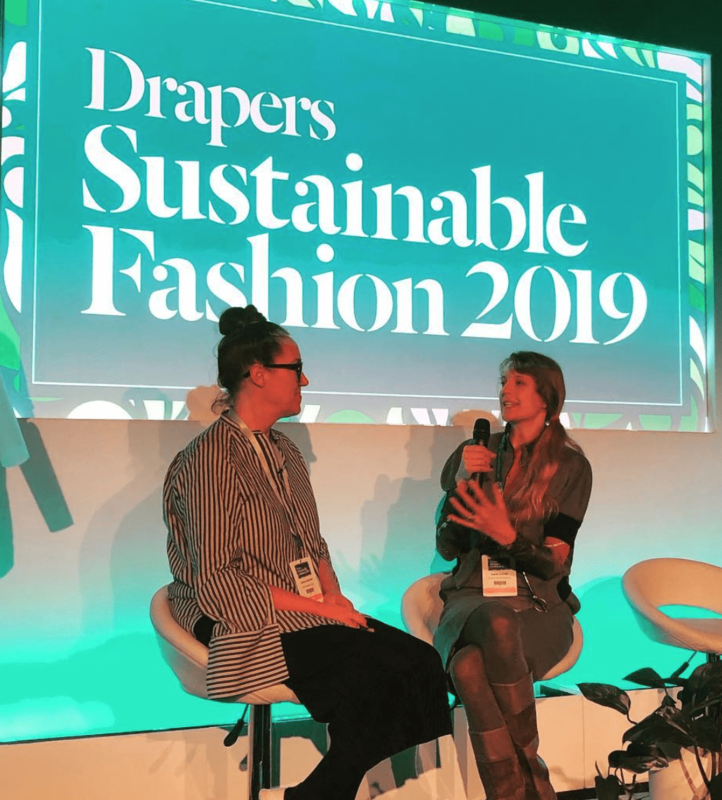 Orsola de Castro, co-founder of Fashion Revolution spoke about the importance of transparency to ensure social and environmental sustainability. She emphasized how persistence and the act of asking questions can change the industry step-by-step, question after question. Her presentation was centred around: Be curious, find out, do something. Charlie Ross, founder and Director of Offset Warehouse was talking about her journey towards sustainability and addressed questions surrounding ethics. 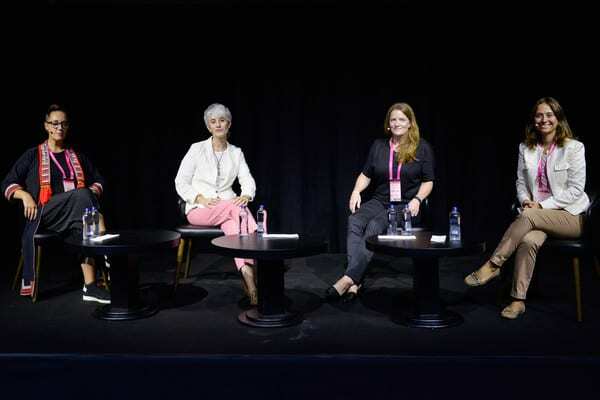 The event brought together experts in the field of sustainability of both the fashion and costume sector and we were thrilled to be part of this conversation and able to offer material solutions. 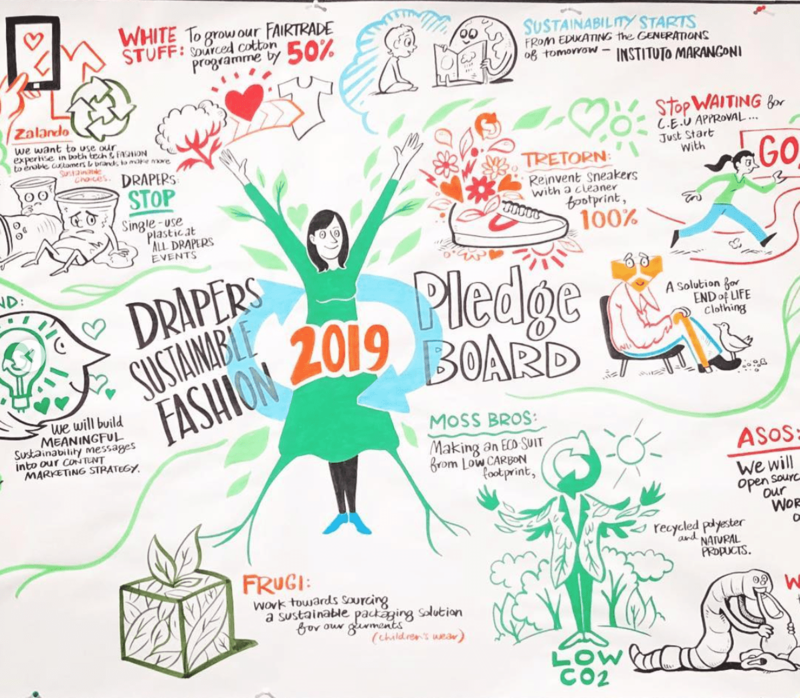 It is great to see that our message to make sustainability key to every design process is also increasingly being embraced by the costume industry. 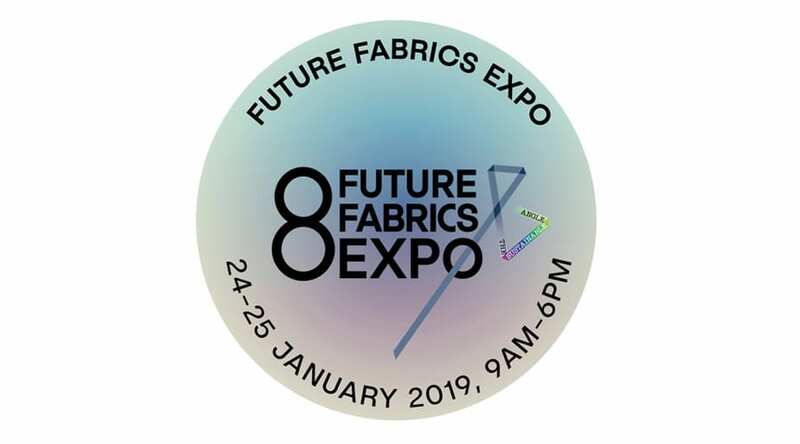 Many of the fabrics displayed at the event can also be found on our Future Fabrics Virtual Expo, online HERE, particularly in the ‘Mills with small order quantities’ section. 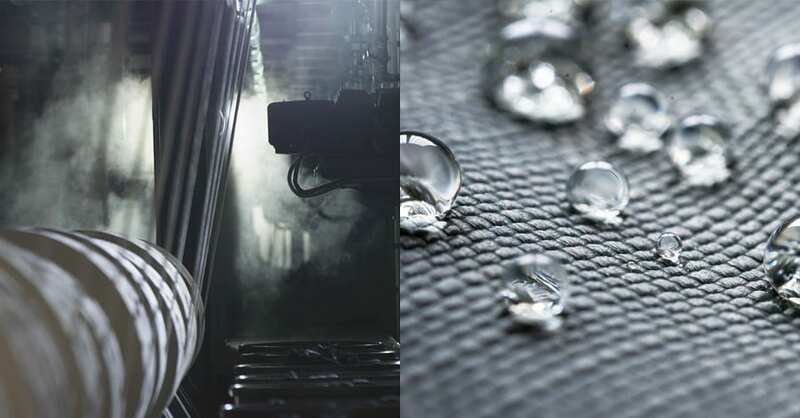 we show a wide variety of sustainable solutions in textiles alongside detailed background information. 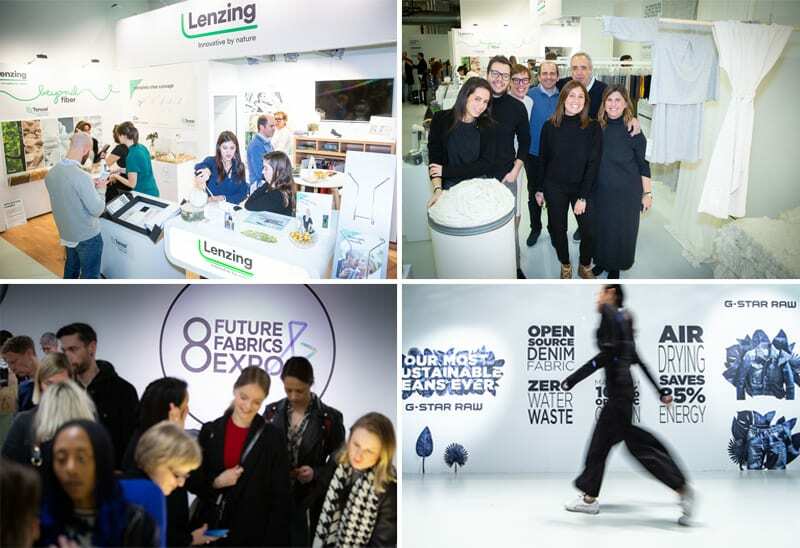 An edition of the Future Fabrics Expo supported by the Lenzing Group is going to be shown at the Copenhagen Fashion Summit’s Grand solutions Innovation Forum from tomorrow, 15th – 16th May 2018. Supported by The Lenzing Group, an international company that produces high-quality botanic fibers from certified renewable raw material wood with environmentally friendly and innovative technologies. 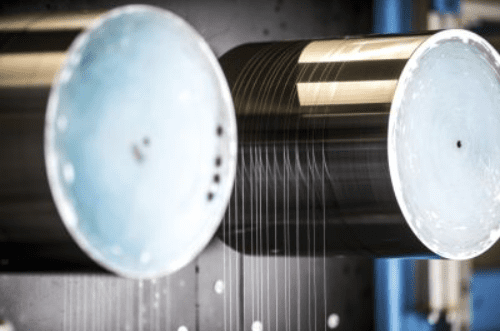 These fibers form the basis for a wide range of textile and nonwoven applications, and are also used in work and protective wear and in industrial applications. 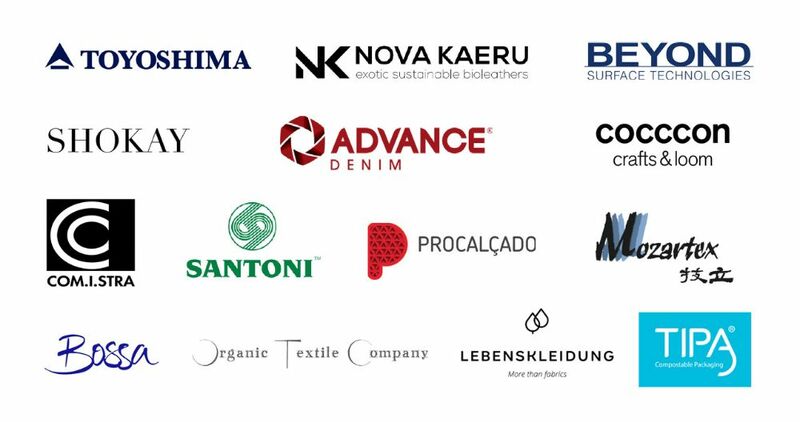 Its products are marketed under the following brands: TENCELT™ for textile applications, VEOCEL™ for nonwovens and LENZING™ for special fiber applications. 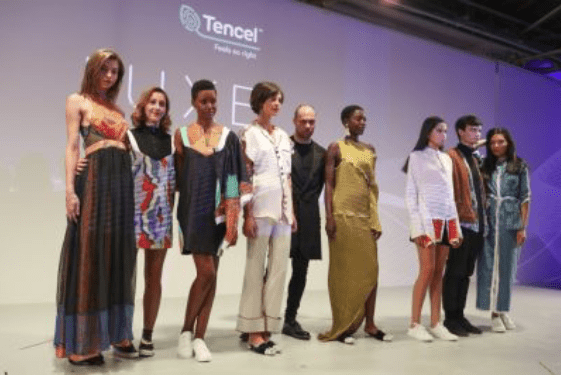 Innovations like TENCEL™ x REFIBRA™ branded lyocell fiber technology, the identifiable LENZING™ ECOVERO™ branded fibers and TENCEL™ Luxe branded lyocell filament yarn make Lenzing a global innovation leader. 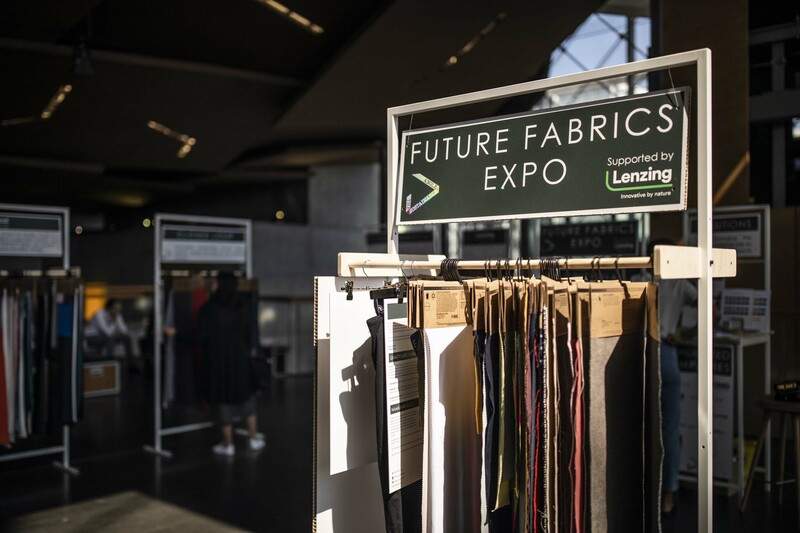 The Sustainable Angle is looking forward to showcasing a curated selection of commercially available, sustainable textiles and innovative materials from our Future Fabrics Expo. This is supported by the Lenzing Group. 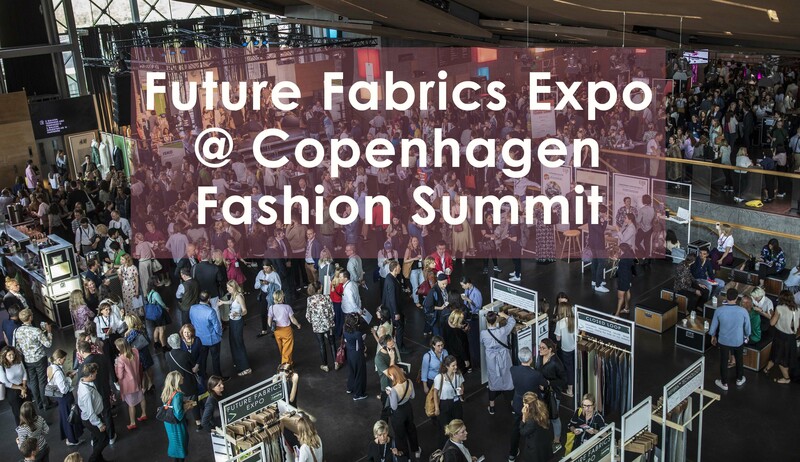 We will be showcasing in the Innovation forum at the Copenhagen Fashion Summit on the 15th and 16th of May 2018 at the Copenhagen Concert Hall. We offer solutions to materials sourcing with a lower environmental impact which contribute to fundamental, transformative change in the fashion industry starting NOW. 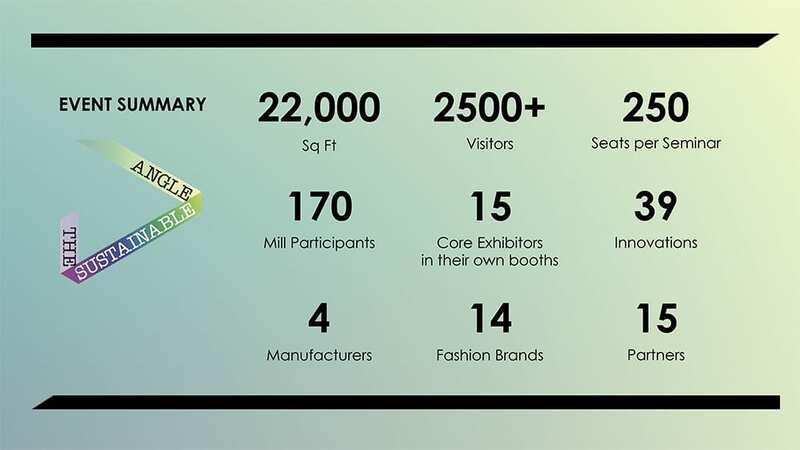 Since 2011. we have promoted and supported the diversification of the global fibre basket with a consistently updated broad and varied range of sustainable materials shown in our Future Fabrics Expo in London which has been visited by thousands of visitors over the last 7 years. Our mills and producers demonstrate more responsible practices, and offer solutions by providing materials with reduced environmental impact, contributing to more transparent and sustainable supply chains. The Future Fabrics Expo is also showing educational background information alongside the materials on display. Each fabric and material has individual sustainability information attached. Each sustainable material has the contact details of the supplier clearly shown. The criteria by which we select the materials are shown as well as the certifications per material are displayed. 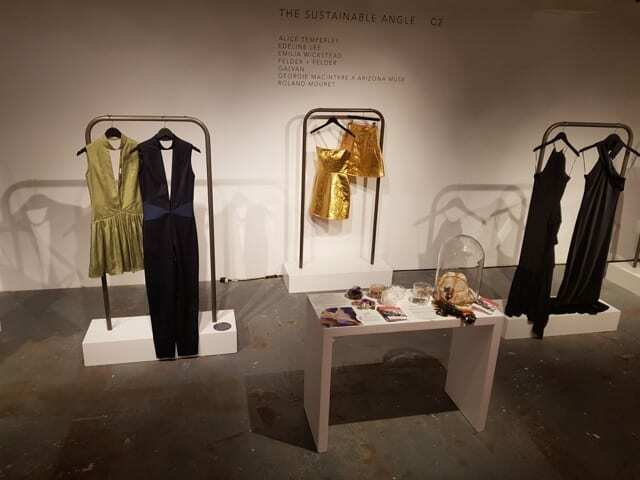 The Sustainable Angle collaborated with seven London designers this season, to inspire and support their fabric sourcing through The Sustainable Angle’s Future Fabrics Expo. 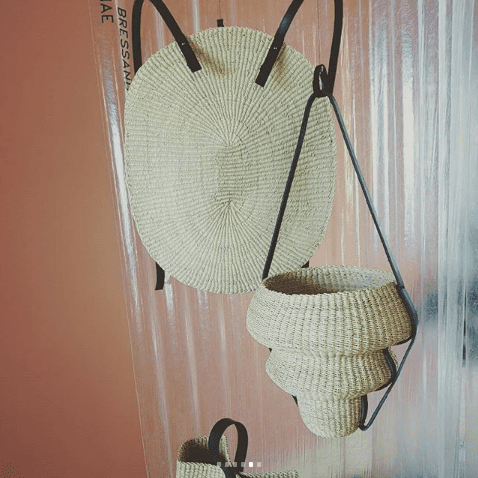 The results of this specially commissioned project, in partnership with Arizona Muse were showcased in the Designers showroom at London Fashion Week. The aim was to communicate the quality, diversity and desirability of a range of sustainable fabrics and materials. 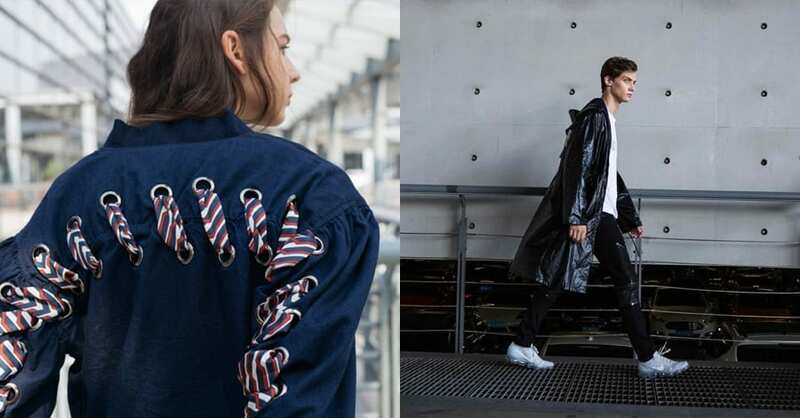 By showcasing designs made with innovative and sustainable materials that represent the future of sustainable design, the designers set an inspiring example to other creators. 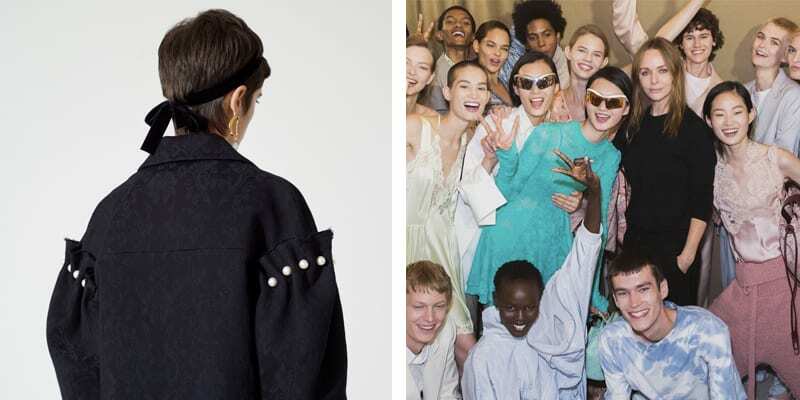 Through this project showcased at LFW, these designers are now armed with the knowledge to question existing out-dated embedded practices, and are discovering sustainable innovative fibres and fabrics that are desirable and commercially viable. Several of the designers were so impressed by the quality of the fabrics and style shown in our Future Fabrics Expo, that they integrated them into their main collection. Edeline Lee – created four garments that were realised using hemp, organic cotton, featuring a Blouse made from TENCEL™ Luxe by Lenzing Group which is made from filaments which is made from eco-botanic lyocell filaments made from wood pulp,which is sourced from sustainable wood, produced using a pioneering closed-loop lyocell production process. 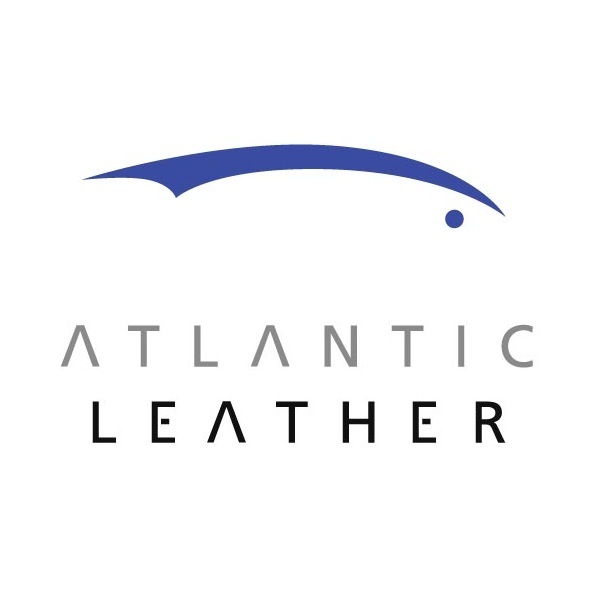 Emilia Wickstead – Used a vegan leather that is a best practice leather alternative avoiding toxic chemicals in the processing, made in Japan. Felder + Felder – dress made from TENCEL™ Luxe, as above detailed, and a jumpsuit made from TENCEL™, see above. Georgie Macintyre x Arizona Muse – Dress and miniskirt from Piñatex™ made from pineapple leaf fibres, lining: TENCEL™, see above. Mini skirt with sequins, made from 100% recycled polyester, lining: GOTS certified organic cotton. Blue dress made from Tencel™, as above. Roland Mouret – Dress from EcoVero™ fibers by Lenzing Group. EcoVero™ is an eco-friendly viscose with the lowest environmental impact. Temperley London – Silk dress using organic GOTS certified, non bleached silk, digitally printed using GOTS certified inks. 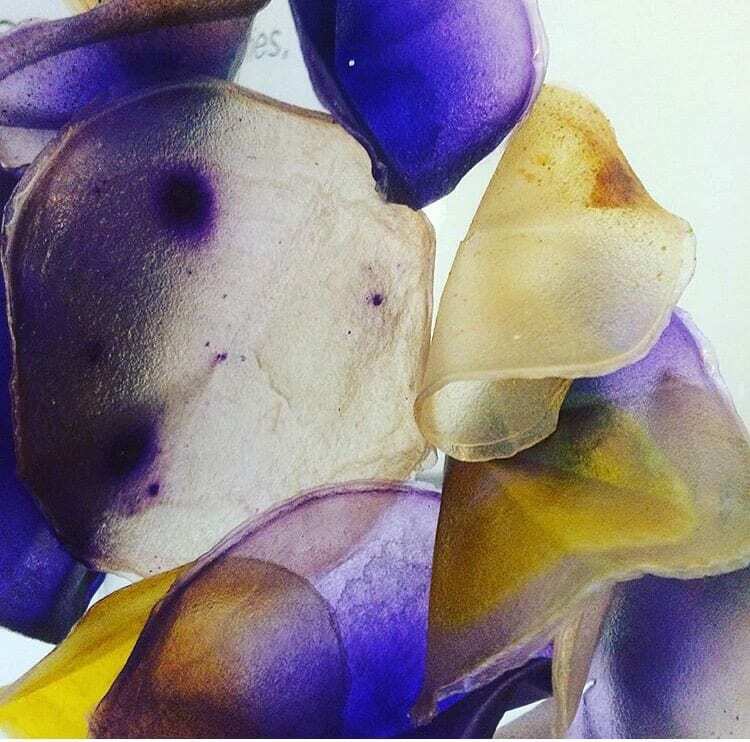 At the London Fashion Week Discovery Lab, we showed the ‘Future of Fashion Materials, and showed visionary materials, such as bio-degradable sequins , experimental biomaterials embellishments, and photosynthesising textiles – reinforcing the future focused message of our LFW Desginers showroom. 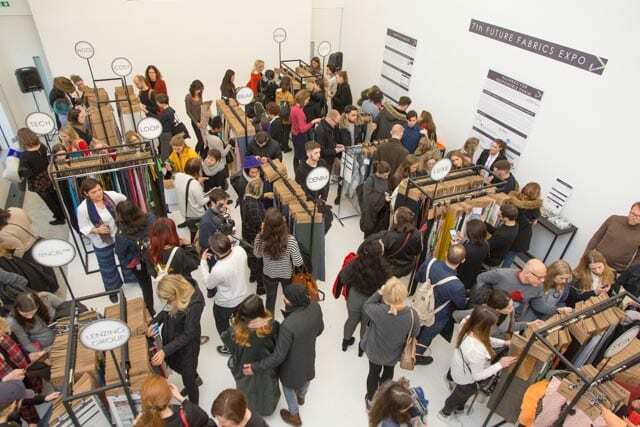 The Discovery Lab created much interest amongst visitors, stylists, bloggers, press and buyers. Sustainability is not a passing ‘trend’ or an option, but an urgent call for action from our industry. It presents new opportunities for re-imagining how we make our fashion products, encouraging an industry that embraces innovation. VISIONARY designers recognise that creativity begins with imagination, but that it also involves curiosity and questioning the very substance of our materials and how we create, make and communicate fashion. An awareness of the impacts of their choices upon people, planet and nature is crucial if we are to sustain our industry intelligently. 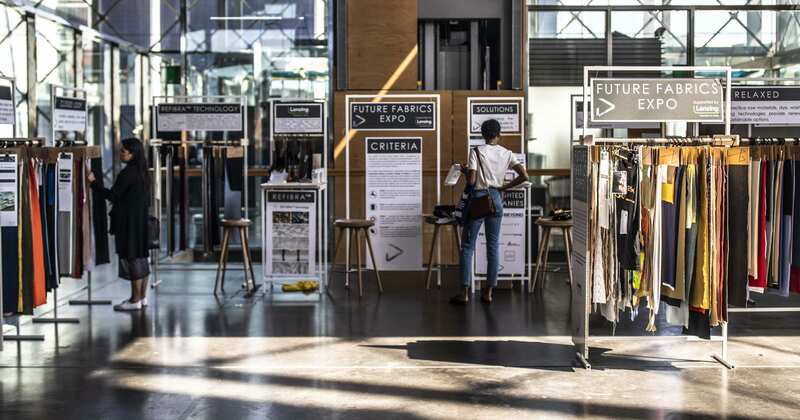 The not-for-profit organisation The Sustainable Angle’s Future Fabrics Expo was conceived in response to a lack of access to sustainable innovative materials, and aims to facilitate and encourage more responsible practices throughout the fashion supply chain. 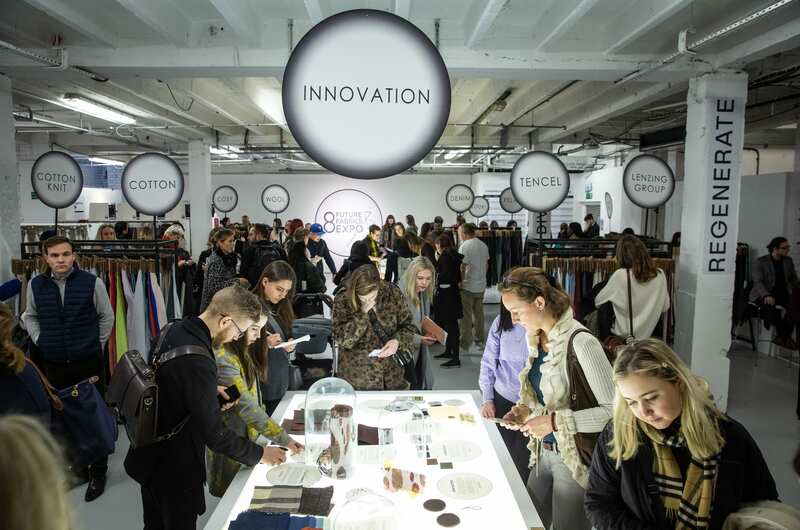 Explore our DISCOVERY LAB, which features a curated selection of exciting emerging innovations and commercially available sustainable materials from our Future Fabrics Expo that spotlight ingenious developments: from bio-degradable sequins, experimental biomaterials, and photosynthesising textiles. 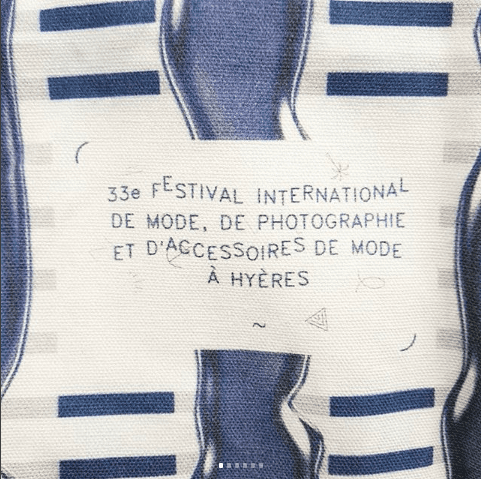 Join us to DISCOVER the future of fashion materials! The Sustainable Angle is a not for profit organisation. 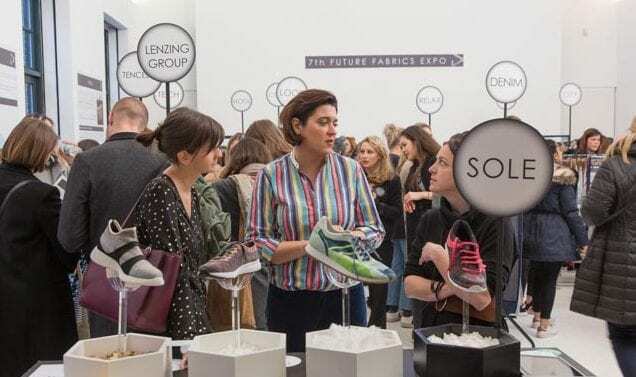 Its main project, the Future Fabrics Expo, promotes sustainable practices throughout the fashion supply chain and connects sustainable innovative fabrics suppliers with fashion designers. The journey toward true design intelligence begins with sustainable innovative fashion materials sourcing. 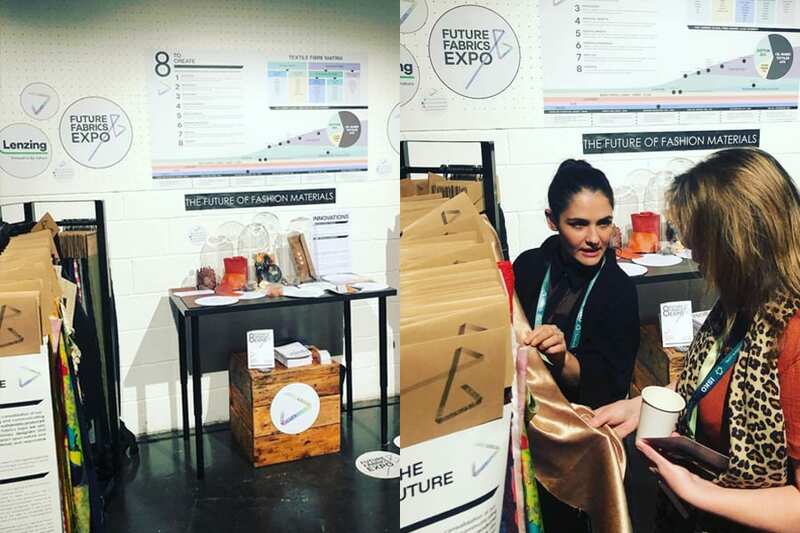 Through our projects such as the Future Fabrics Expo, we inspire designers to start working with more sustainable fashion materials for their collections. 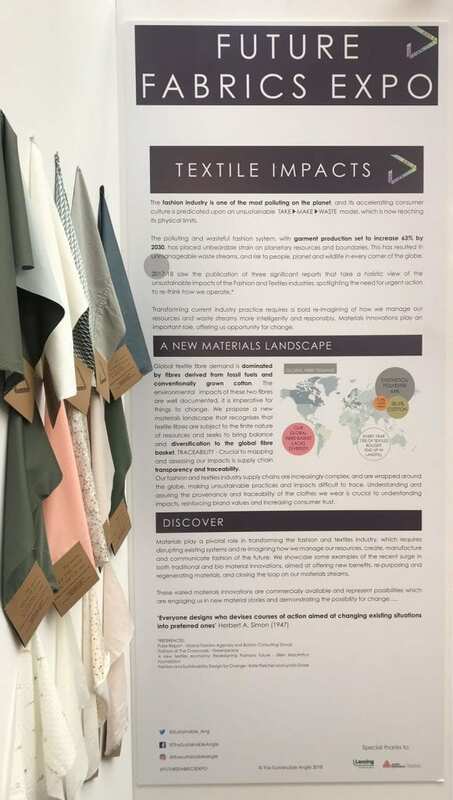 The pieces and outfits realised in responsibly produced sustainable innovative fabrics and materials sourced via The Sustainable Angle’s Future Fabrics Expo. 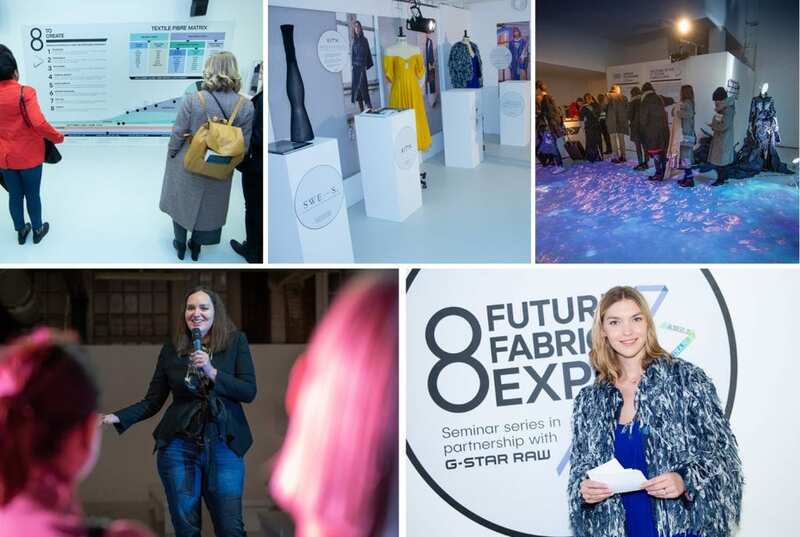 The 7th Future Fabrics Expo (FFE) showcased 5000 sustainable innovative fashion materials that are commercially available from around 150 suppliers on 24th-25th January 2018 at Iris Studios, London, to over 1000 visitors from the fashion industry. The Future Fabrics Expo was again a showcase with an atmosphere that was buzzing and excitement was in the air throughout the two days as visitors discovered sustainable innovative materials that they can work with today, that are true, sustainable, viable alternatives to the conventional fibres currently available. As usual, it was so busy that there was a danger of having to close the expo to new visitors as we reached full capacity. The BBC Worldservice film crew came over to film the FFE in order to feature part of it in their upcoming documentary on sustainable fashion. Visitors left feeling motivated for change having gained access to 150 suppliers contact details, having experienced 5000 materials and individual information about their certifications. Visitors left empowered, ready for change, armed with knowledge gained through the seminars, through the explanations written on the back of each fabric card attached to each material. 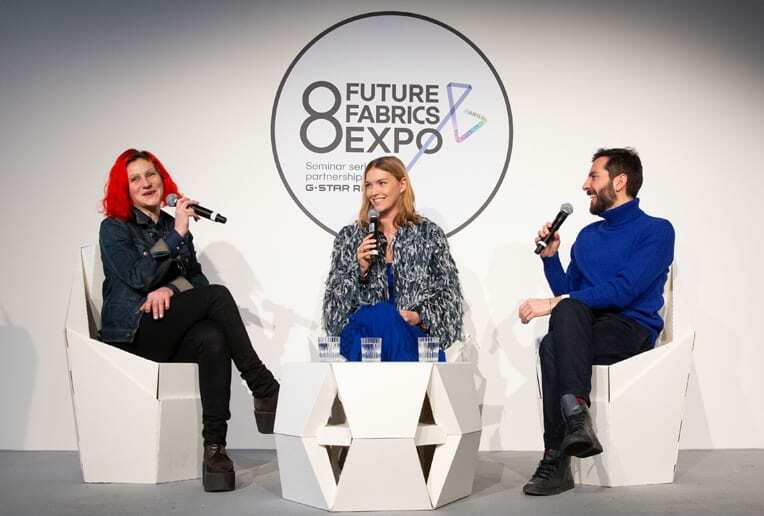 The 5000 fashion materials that were on display in 7th Future Fabrics Expo embody a range of sustainable principles and new technologies, sourced from international suppliers and mills who demonstrate a commitment to lowering the environmental impact across the textile supply chain. The two day event, set up in 2011 for the first time, is the largest showcase dedicated to sustainable innovative materials and is unique in that it is a curated showcase accompanied by educational background information displayed throughout the showcase in order to promote and facilitate more informed material selections and practices within the fashion industry. 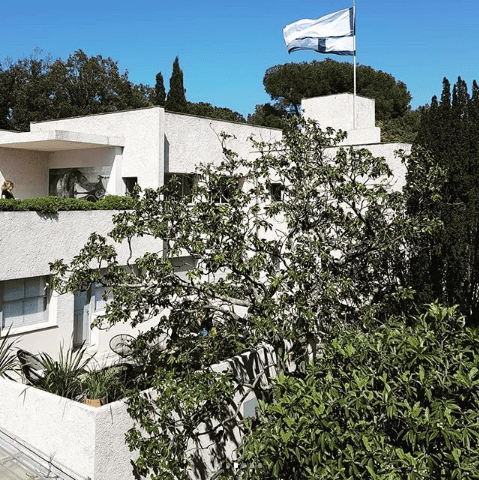 Lenzing – Eco Botanic solutions! 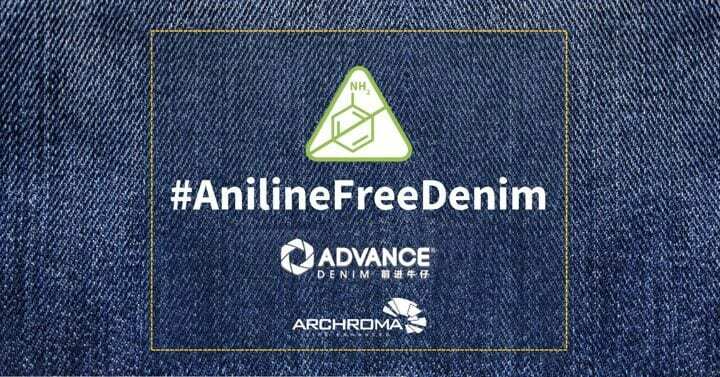 From innovations such as biodegradable sequins, to Orange Fiber (made from citrus peel waste of the food industry), post consumer recycled denims, grape leather (from the wine industry), textiles from Pineapple plants, to more traditional qualities such as sustainable denims, low impact wools, organic cotton knits and wovens, low impact silks and cellulosics like TencelTM and TencelTM Luxe following the circular economy model, the FFE prides itself in showing sustainable fashion materials that are commercially available today. 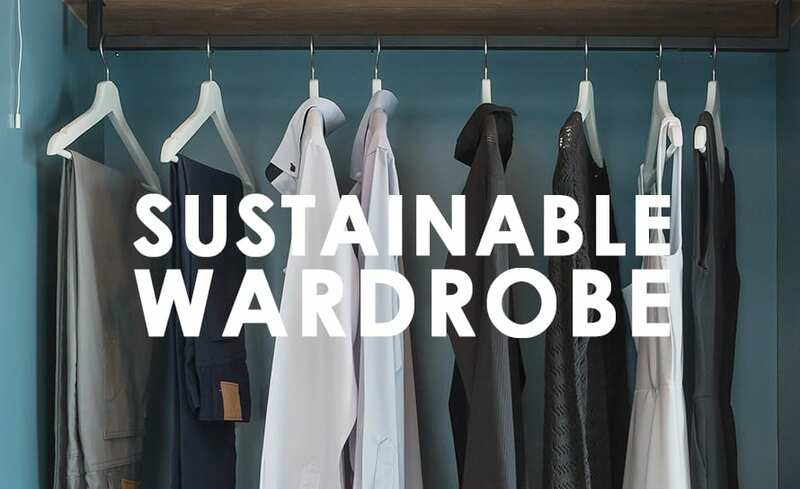 They represent true sustainable alternatives to the widely available conventional fabrics that currently dominate the market which are unsustainable (conventional cotton and polyester). Alongside this we also show fabrics and materials of the Future within our innovations section. This year we showed an amazing range including bio-degradable sequins from Rachel Clowes, post carbon fashion that merges algae with fibres from Dianjen and biomaterials developed and grown with food-grade a project from Maryssa and Laure, with the innovations section we want to give our attendees something to think about the future of the materials they are using. The Sustainable Angle is excited to report that we have arrived at London Fashion Week! 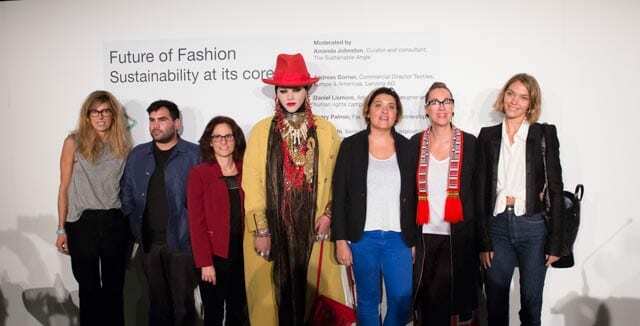 As part of the #londonfashionweek Positive Fashion initiative that launched in September 2017, The Sustainable Angle held a talk: ‘Future of Fashion: sustainable innovation at its core’ which took place on the 18th September 2017, an unprecedented subject to be discussed in the catwalk space of London Fashion Week. Helen Sahi talked about Avery Dennison’s big picture approach to sustainability, by being ambitious about its goals and seeing itself as a key change initiator. Helen is a member of the board of the Sustainable Apparel Coalition and works together with other major fashion and shoe brands on the continual development of the Higg Index, a self-assessment standard for assessing environmental and social sustainability throughout the supply chain. Avery Dennison RBIS supports the fashion industry to make sustainable packaging and labelling solutions a reality by, for example, using renewable resources in packaging. 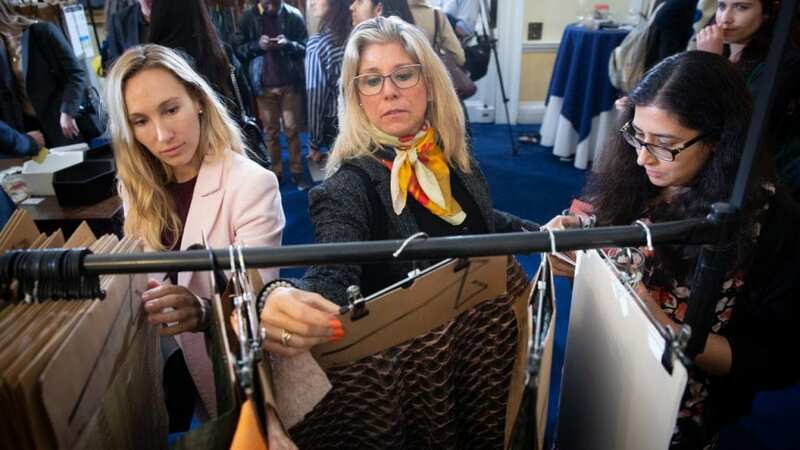 Helen also highlighted that while Avery Dennison as primarily a label supplier in the fashion industry has a seemingly limited environmental impact, its influence is much greater as widely assumed. Not only is Avery Dennison a key player with an annual revenue of $6.3 billion and thereby able to set new trends influencing partners and competitors alike, but with the growing importance of recycling in the clothing industry, labelling itself is gaining importance. If you don’t know where your garment came from and what it is made out of, it is difficult to know where it can go at the end of a consumer life-cycle. Oya Barlas-Bingul from the Lenzing Group highlighted some of the core benefits of their closed-loop production process of cellulose fibres and highlighted that challenging the status quo of today’s fibre mix is at the very core of the values of Lenzing Group. One of their latest innovation, Refibra™, has just been launched on the market, and a brand new innovation for the luxury market is being introduced in October 2017 in Paris. New innovations that lessen the burden on our resources, and close the loop on our waste streams are needed. There are estimates that the need for clothing will have doubled by the year 2025. 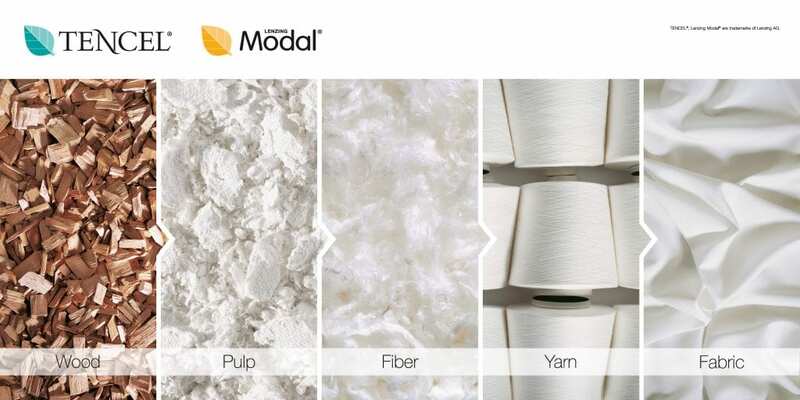 Refibra™ fibres, are one solution to this problem, as they are not made from virgin material, but partially made from pulp that contains cotton scraps left over from post industrial cutting operations and sustainably managed wood, FSC certified. The fibre is produced in a closed loop lyocell process. When the question was raised about prices of sustainable materials, she emphasized the point that there are major efficiencies that come into play when using Lenzing’s yarns which reduce the price overall in the production stage. Henry Palmer from Bysshe talked about some of the challenges small companies in the textile supply chain are facing and expressed frustration at the limited financial investments in sustainable innovations currently around. As Co-Founder of Bysshe, a small but thriving mill in the UK of high-quality cotton/hemp blended fabrics, he highlighted that the sustainable textile industry could easily expand faster if more investment was available, and hence become competitive: Scalable production will allow prices of sustainable materials to drop, and will therefore become more widely accessible. He also gave some insights into Bysshe dyeing practices and options available. Bysshe are currently using high quality synthetic dyes form trusted partners in the UK, for their hemp/cotton denims. The combination of the low impact synthetic dye with their fabrics which are as low impact on the environment (hemp being a bast fibre) and of a high social standard make a great long lasting and responsible high-quality fabric. While they are trying to revive old practices, Bysshe is not afraid of using modern technology, if used responsibly. Daniel Lismore spoke about how core it is to harness creativity by pushing forward innovative ideas and highlighted his insights from a designer’s perspective. The role of the designer has to evolve with the sustainability challenge. He also drew attention to the fact how significant the impact of a single person can be and encouraged those with a voice to use it to challenge the status quo and change the industry from within. Daniel himself started to use recycling techniques in his design and art projects and has fronted the Close the Loop sustainability in fashion campaign for H&M. sustainability is a mind-set, is not only very interesting to learn about but is very exciting and fun to be engaged in. This mind-set has for her opened new, interesting doors. She also highlighted how the fashion industry should tell more the ‘story’ of the garment. 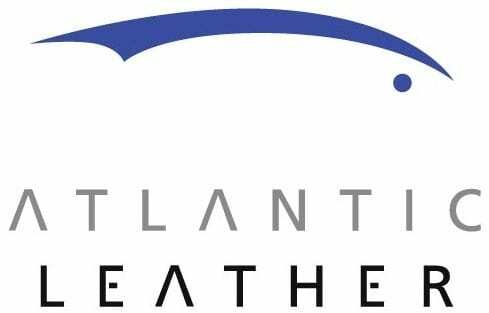 opportunities that are positive, exciting and bring efficiencies and possibilities that make sense not only for the environment but future-proof businesses. At The sustainable Angle we are proud to announce that our partners from the Lenzing Group will be hosting a masterclass at our studio in West London. The core competence of the Lenzing Group is producing botanic fibers for the textile and fashion industry from the renewable raw material of wood. 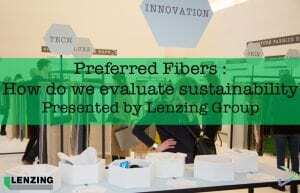 Masters of closed loop fibers including TENCEL®, Lenzing Modal®, Lenzing Viscose® and latest innovative fibres as Refibra™ and EcoVero™ the Lenzing Group will teach us about fibers and how to evaluate the sustainability of what we are using. 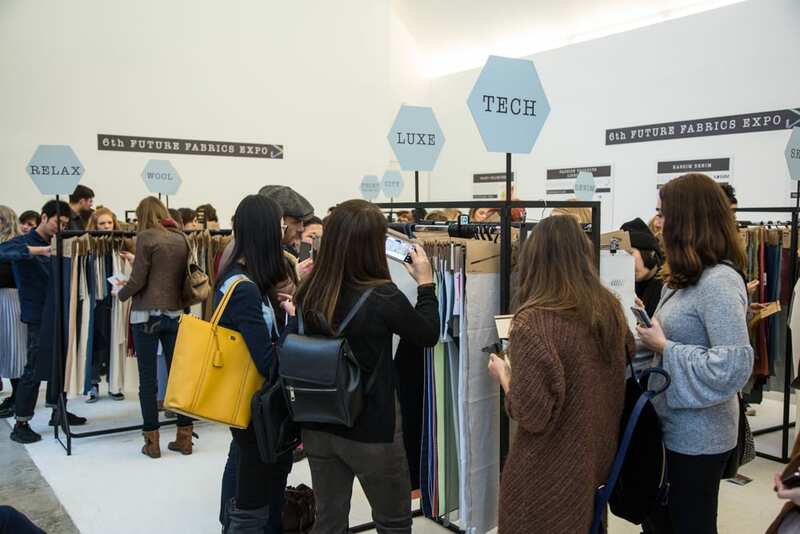 * Experience a selection of over 3000+ materials and textiles with a lower environmental impact. * Get hands on with innovative materials including TENCEL® and Lenzing Modal® mixes. * Learn about sustainable practices within the fashion industry. 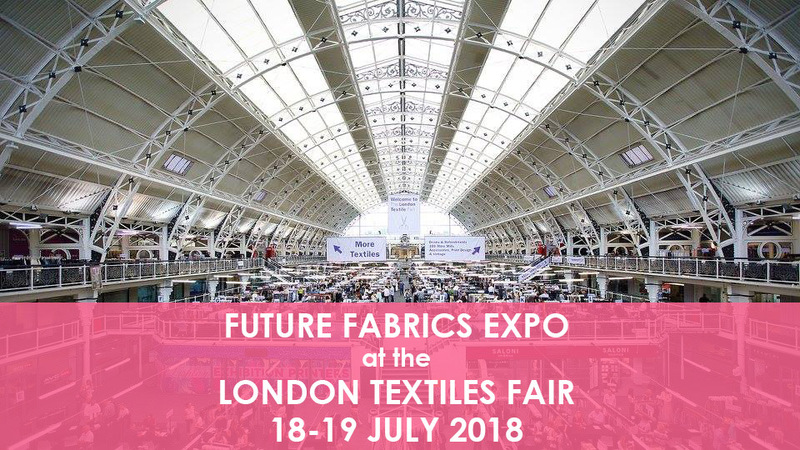 The Future Fabrics Expo is a showcase of innovative and traditional commercially available fibres, fabrics and products that embody a range of sustainable principles and new technologies, sourced from international suppliers and mills who demonstrate a commitment to lowering environmental impact across the textile supply chain. It includes more sustainable alternatives to the widely available conventional fabrics that currently dominate the market, helping fashion companies to begin diversifying their fabric base and lowering their environmental impact at the same time. Materials at our studio will be ideally suited for a wide range of market levels and product types. 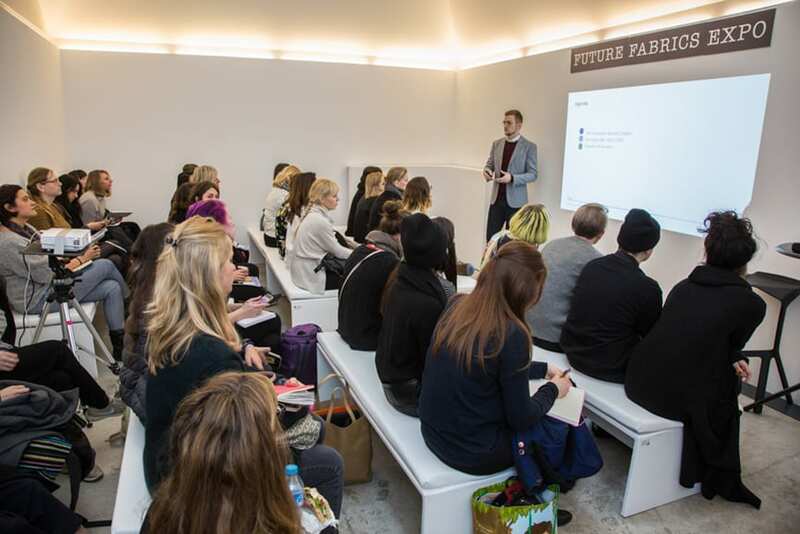 The Future Fabrics Expo Masterclass will be held at our West London studio, London. Our new masterclass Mastering Sustainability – material sourcing for designers will be held at our West London Studio on the 7th November. 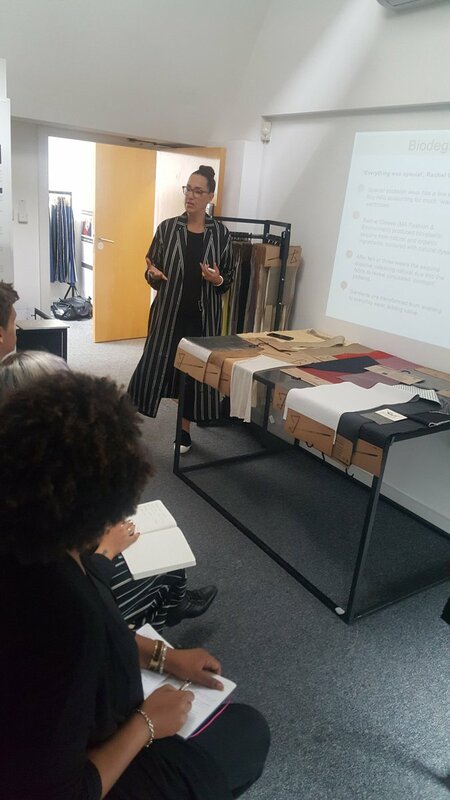 We have added more dates for our masterclasses due the high demand we had from fashion brands following on from our previous classes earlier on this year. The first in the series will teach designers about material sourcing and the decisions that need to be made as a designer from a sustainable angle. 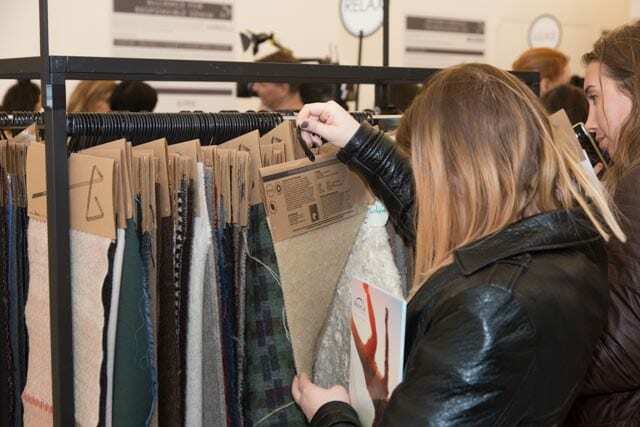 Furthermore we give attendees the chance to discover a diverse range of sustainable materials and resources from the Future Fabrics Expo collection. They will receive our coveted sustainable sourcing guide, which includes a list of suppliers and their contact details. The Masterclass runs from 9.30am – 12.30pm at 9.30am we’ll have coffee before a prompt start at 10am. You will experience over 3000+ materials with a lower environmental impact, touch and feel them at your leisure after learning about what you should be taking into consideration when sourcing materials sustainably. The masterclass is an interactive and tactile experience to interest and inspire you. 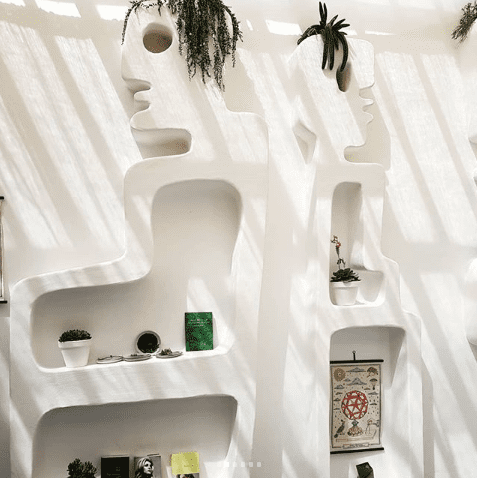 You will be given guidance to prepare you for the decisions you’ll need to make as a designer when sourcing and makes it easier for your brand to integrate sustainability at the heart of what you do. 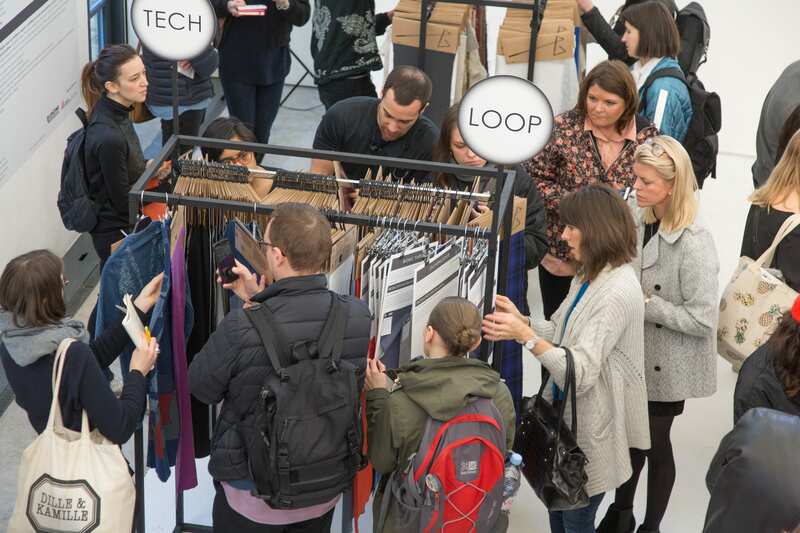 Experience a selection of over 3000+ materials and textiles with a lower environmental impact. Get hands on with more sustainable materials and exciting innovations. It includes trims and cords, fibres such as regenerates, recycled fibres, wool, organic cotton, low impact leather and leather alternatives as well as innovative new materials. 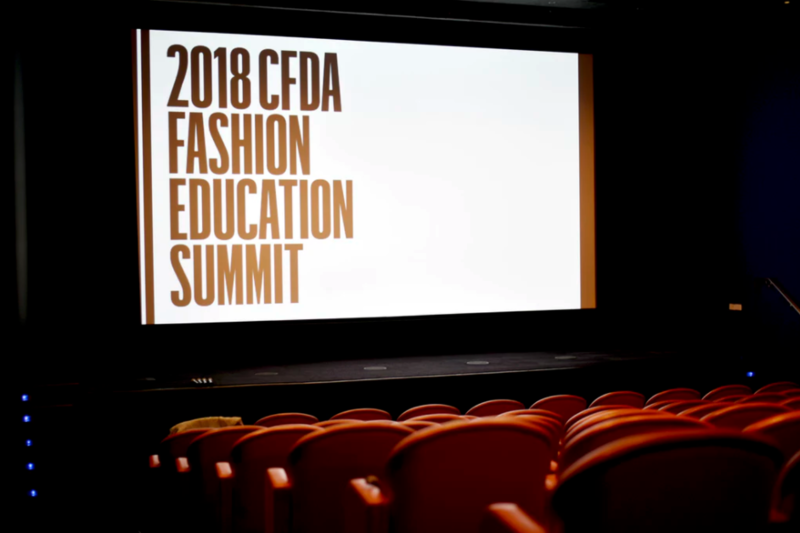 Learn about sustainable practices within the fashion industry in general. Read detailed specifications for how each material on display is uniquely sustainable. 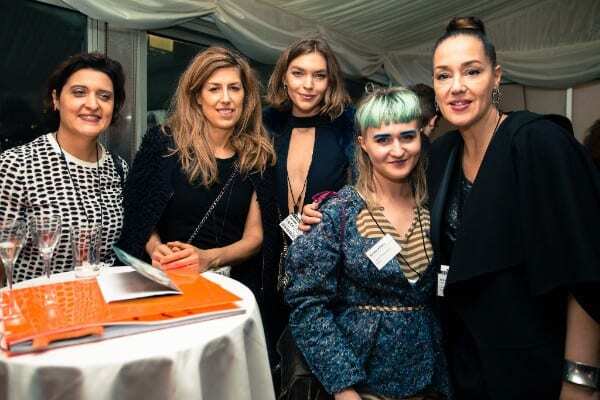 To mark the occasion of the Graduate Fashion Week’s Dame Vivienne Westwood Sustainable and Ethical Award sponsored, by Lenzing Group, the Sustainable Angle who supported the award, organised a panel discussion ‘Designing for Sustainability in fashion’. 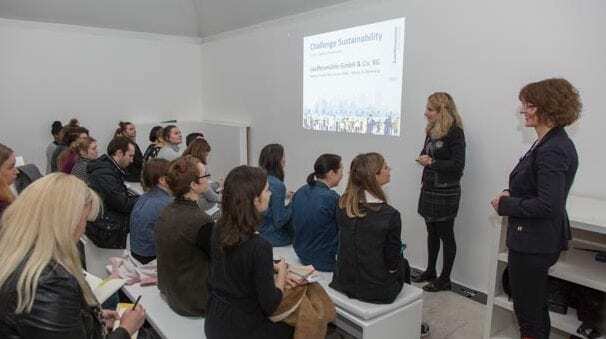 Nina Marenzi, founder and director of The Sustainable Angle, gave an introduction about the organisation and how the sustainable materials sourced by TSA inspire and show a future where we can manage resources wisely and cost effectively, and recognise sustainability as a positive game changer. Fair and responsible labour practices need to be an integral part of the operations of all businesses. Johannes Kraeter from Vivienne Westwood, product development, talking about the key challenges in his role. Oya Barlas Bingul from the Lenzing Group, talking about their award-winning low-impact cellulose fibres like Tencel and Refibra™. Henry Palmer from Bysshe who shared insights of the production of organic cotton and hemp fabrics. 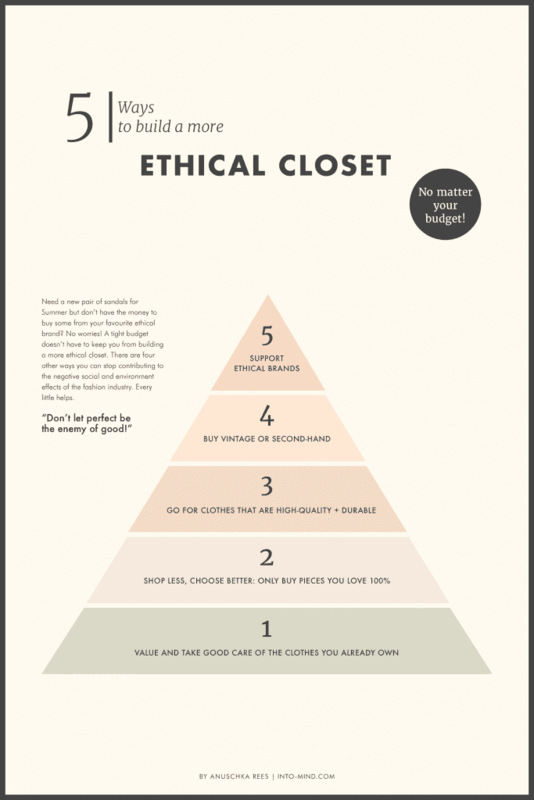 Tamsin Lejeune, founder of the Ethical Fashion Forum, touched upon some of their projects promoting change. 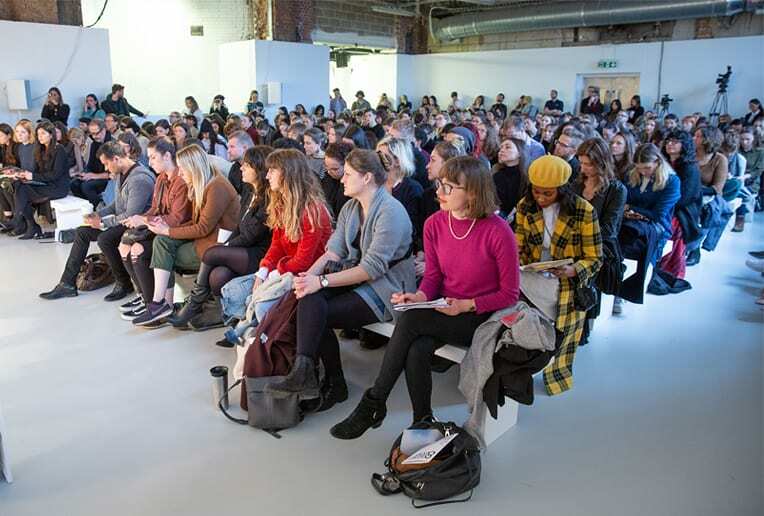 The discussion centred around examples of more sustainable and responsible materials for fashion both man-made and natural fibres which have a lower environmental impact, highlighting the variety of choices available and the necessity to move away from conventional, unsustainable polyester and cotton currently dominating the market. The Lenzing Group highlighted their closed loop production process and key benefits of their different fibres such as Tencel and Refibra™. Oya Barlas Bingul explained how Lenzing group fibres to be more sustainable at every step in every season. 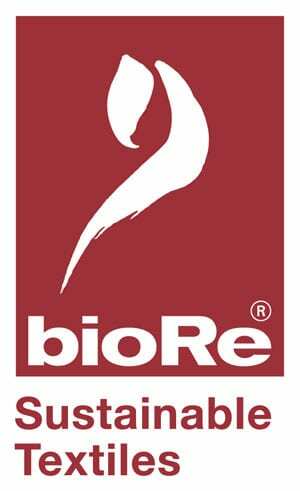 She insisted upon transparency, certifications and traceability being key, all met for fibres such as Refibra™ branded lyocell fibres from cotton scraps and wood is produced in an eco-friendly closed loop production process of 99.7% and its use of bioenergy. 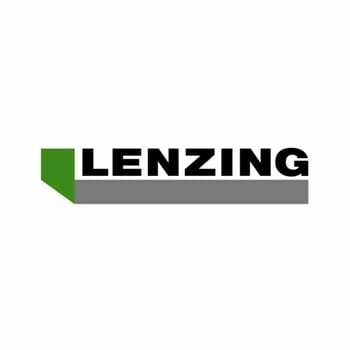 Lenzing is thereby the first manufacturer to offer cellulose fibres featuring recycled material on a commercial-scale. This process is reducing the need to extract raw materials from nature, lowering the impact on natural resources and initiating an important step towards the circular economy for textiles. Bysshe, a mill specialising in the use of natural fibres emphasised that to ensure a fabric range that protects the environment and supports non-exploitative textile production, sustainability, informed decision-making and regional autonomy are crucial in the long run. Henry Palmer also talked about the different dying options available and about possibly using synthetic dyes if they are produced with a lower environmental impact. The panel also discussed some of the challenges to make the change happen, as more and more people seem to desire. 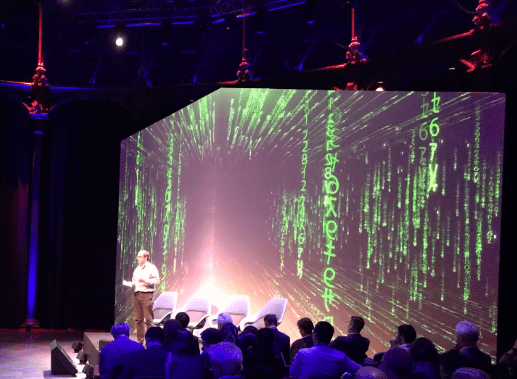 Tamsin Lejeune talked about how SOURCE giving the industry an easy platform to facilitate research and industry collaboration, ensuring that best-practice enterprises are benefitting by being featured on the top of every search. A real insight in the challenges designer brands face came from Johannes Kraeter who talked about the product development process of the multiple lines of Vivienne Westwood, highlighting besides others that sustainability goes ways beyond choosing the right fibres or production processes, but is also about the quality and longevity of garments implying the huge environmental impact that comes from today’s throw away culture of clothing. After these insights a Q & A followed which led to an engaged discussion of not only how to make the right fibre choices, but most importantly of how to think creatively and how sustainability should be recognised as a game changer and an opportunity, not a burden, for businesses as well as society overall. 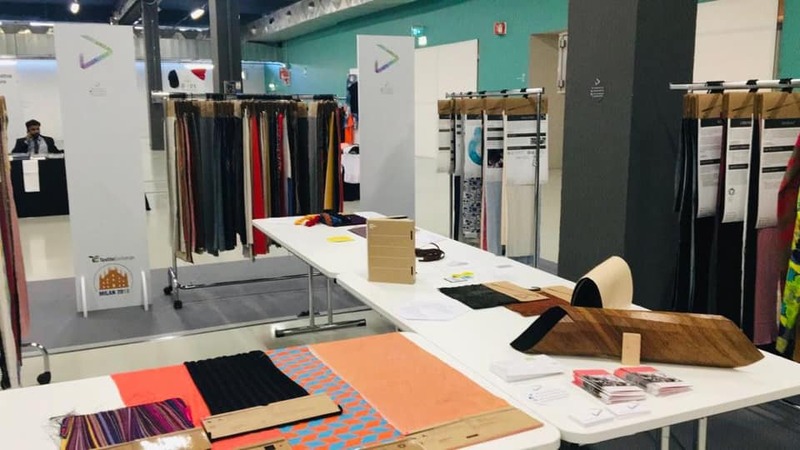 Since its launch in 2011, The Future Fabrics Expo, presented by The Sustainable Angle, has continued to develop as a unique sourcing platform for sustainable materials. 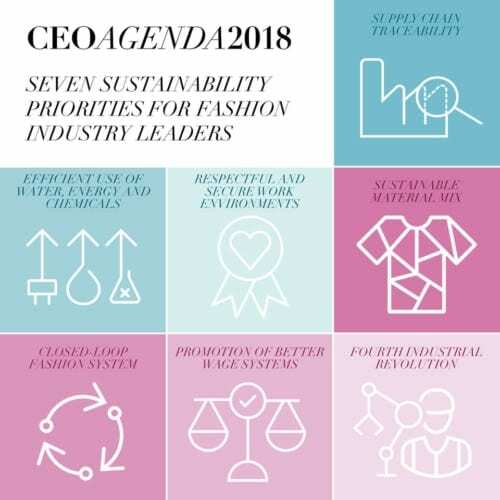 This includes providing the fashion industry with sustainable materials knowledge, innovations and general information about sustainability in fashion, all situated within an extensive showcase of 3000 globally sourced materials from over 100 mills, all with a reduced environmental impact. 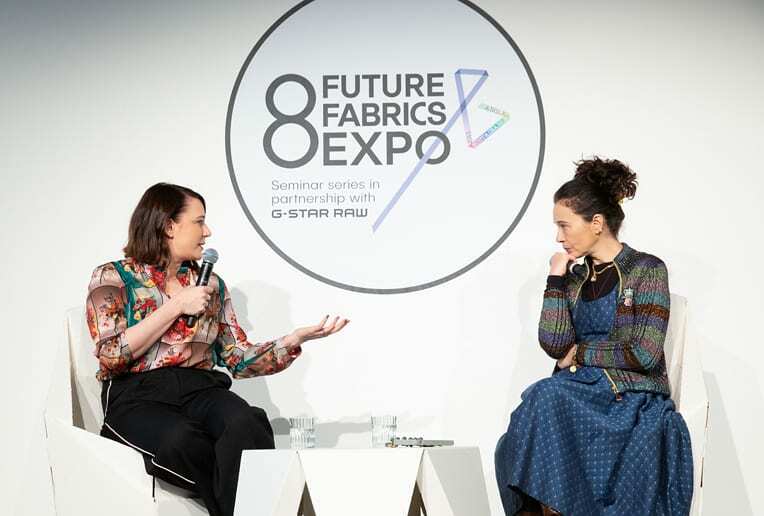 A key aspect of the Future Fabrics Expo experience is how the tactile experience of a broad range of sustainable materials, and contextual knowledge informs creative and sustainable decision making, leaving our visitors inspired, informed and ready for change. 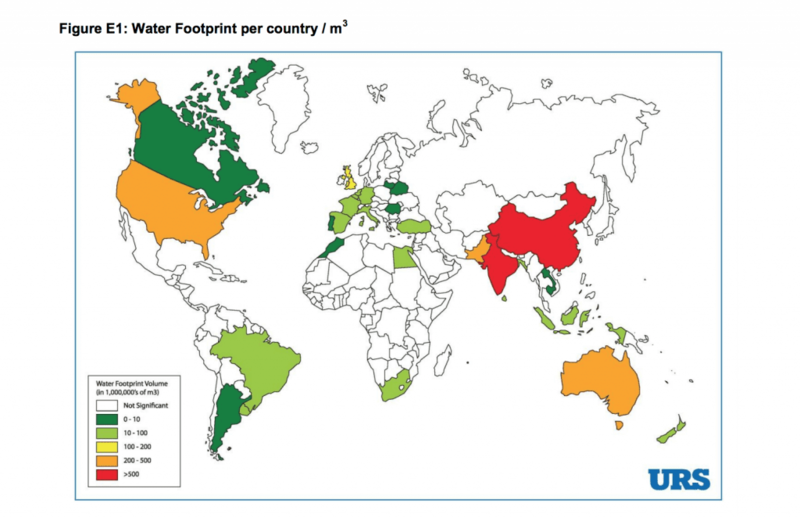 There is an urgent imperative for the fashion industry to transition to an industry with a reduced environmental footprint. Therefore our emerging graduates need to be armed with knowledge about sustainability and their responsibility as future creators. Making this knowledge and experience of sustainable materials available to both lecturers and students, this new educational resource is an indispensable tool. It provides an educational tool kit for lecturers with which sustainable materials knowledge can be embedded into the curriculum. 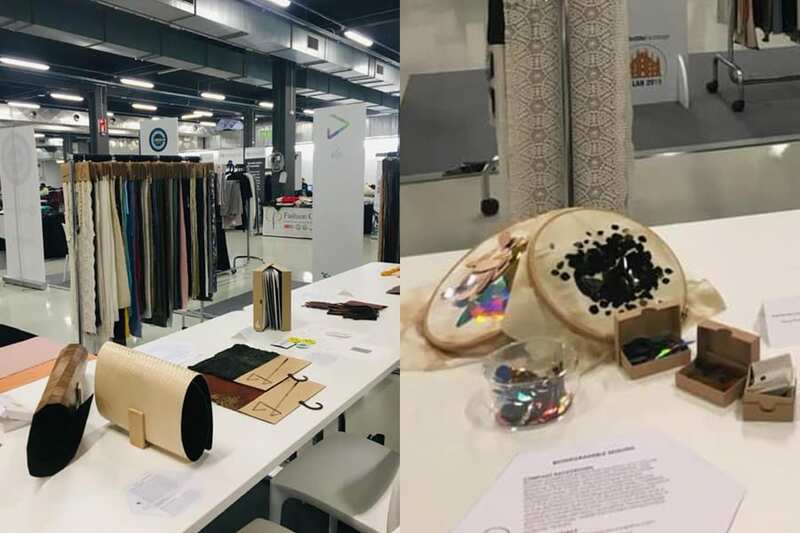 With a download including 13 modules, accompanied by swatch boxes, sustainable materials can be integrated into existing fashion education curricula, stage by stage, efficiently and at low cost. 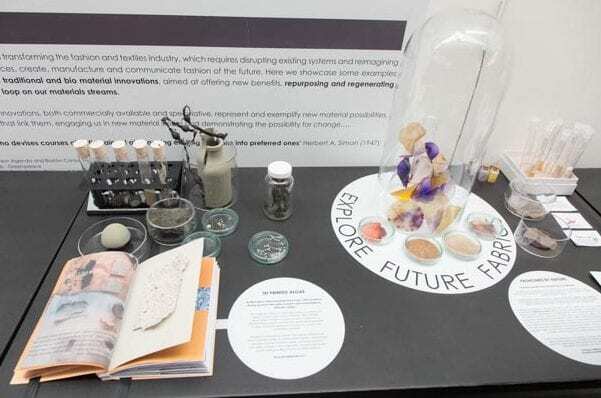 Through guided interaction with 13 modules, students learn about sustainable materials, defined by provenance of fibre, their processing journey, and by what criteria they are more sustainable. Students are also offered a tactile experience by relating this learning to the swatches supplied in the swatch boxes accompanying each module. The swatches are made up of diverse types of sustainable materials which match the educational modules, and enable a tactile learning experience, reinforcing the core texts. Download content and swatch boxes are available at a competitive yearly subscription rate, which is supported by The Sustainable Angle’s funding through our environmental foundations and sponsors. 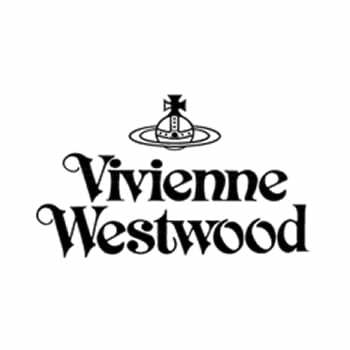 The Dame Vivienne Westwood sustainable and ethical award is part of Graduate Fashion Week, London, 4 -7th June, 2017, and is given to a student for designing and creating a sustainable, ethically aware and socially responsible product with a lower environmental impact. 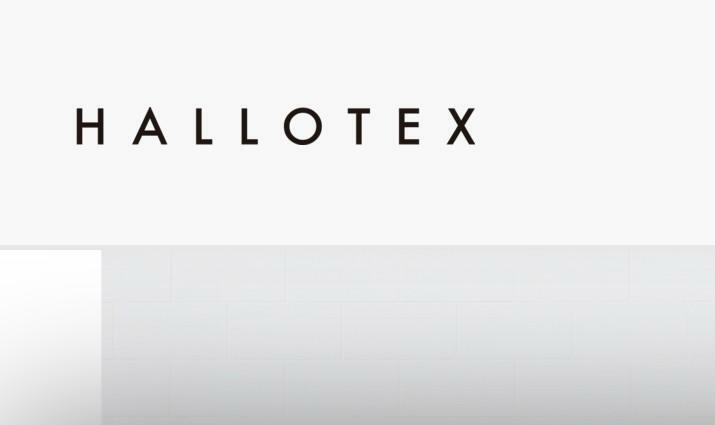 The award is sponsored by Lenzing Group, a world market leader in the global textile and nonwovens industry producing high-quality botanic fibers. The awarded design must embody and communicate sustainable and ethical practices using sustainable raw materials with a lower envrionmental impact, manufacturing and production techniques. 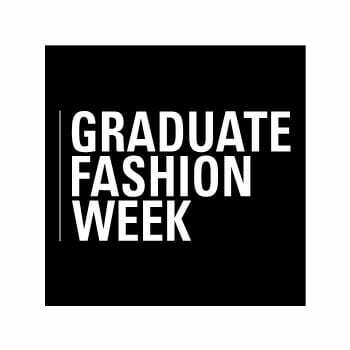 The award is announced on 5th June 2017 at Graduate Fashion Week. 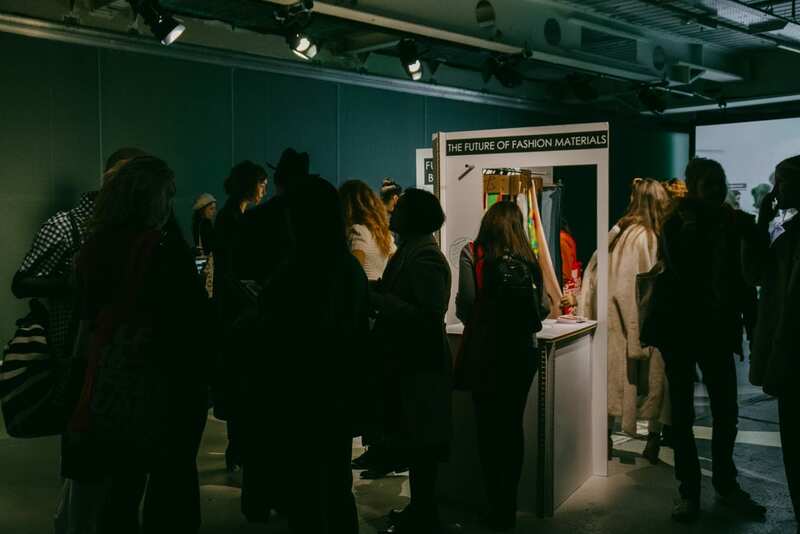 Part of the award is a cash prize as well as a visit to The Sustainable Angle studio which is a supporter of the award, as well as The Ethical Fashion Forum, promoting designers in sustainable fashion. The awarded garment will be shown again at the Graduate Fashion Week event in October 2017 at the Houses of Parliament.